Spicer-Dufay samples from the Kodak Film Samples Collection at the National Science and Media Museum in Bradford. Spicer-Dufay samples from the Kodak Film Samples Collection. Credit: National Science and Media Museum Bradford. 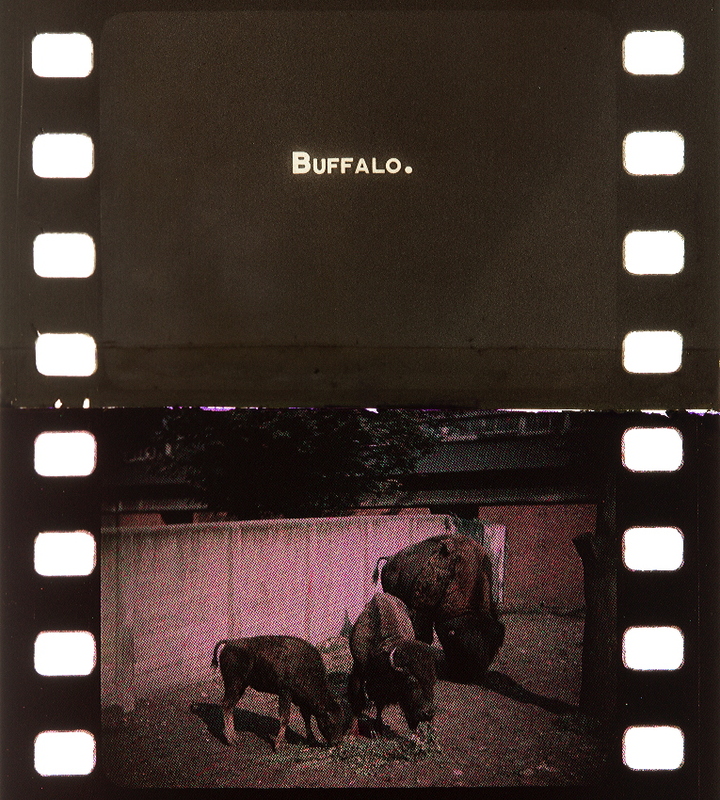 Photographs by Barbara Flueckiger in collaboration with Noemi Daugaard. 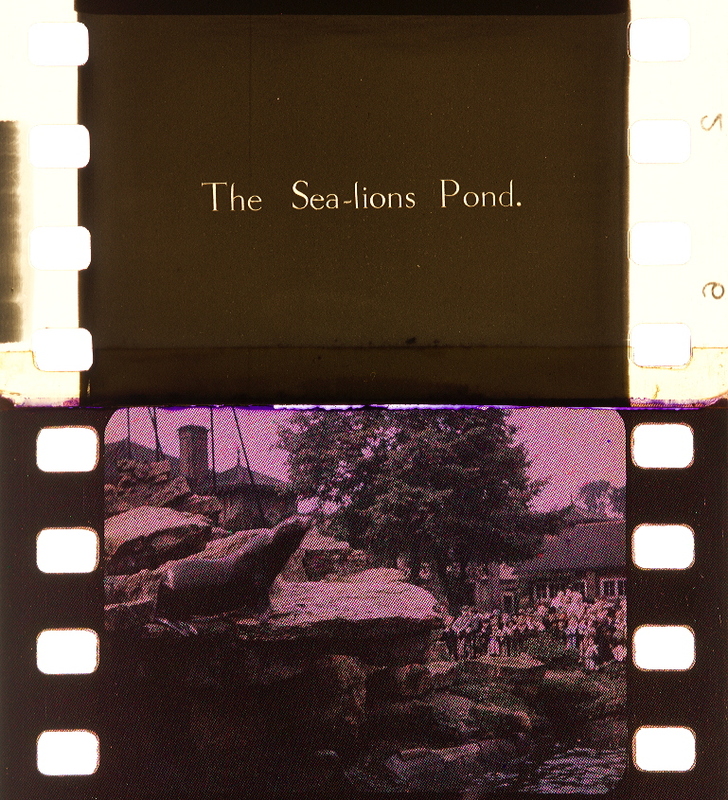 London Zoological Society (GBR 1931). 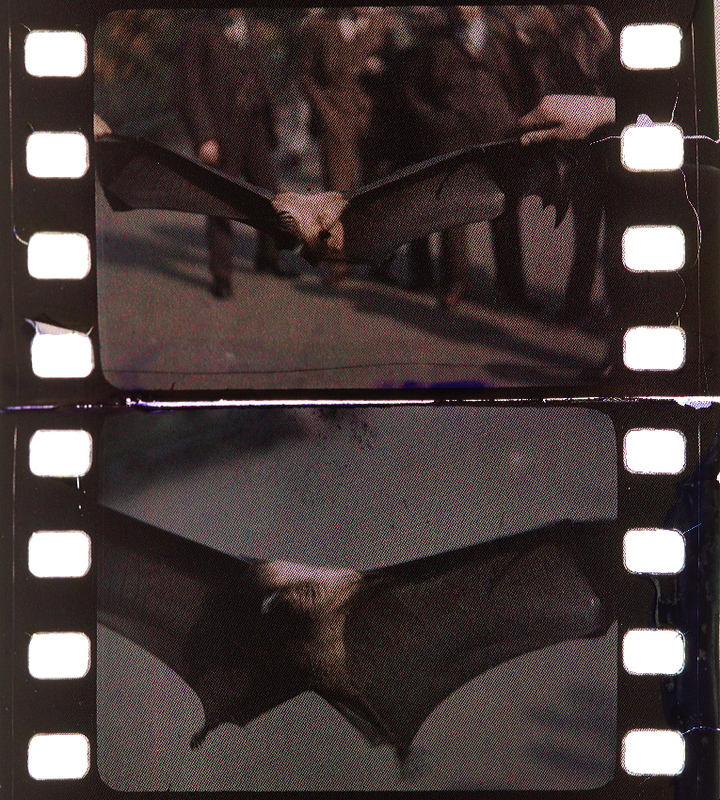 Credit: BFI National Archive. 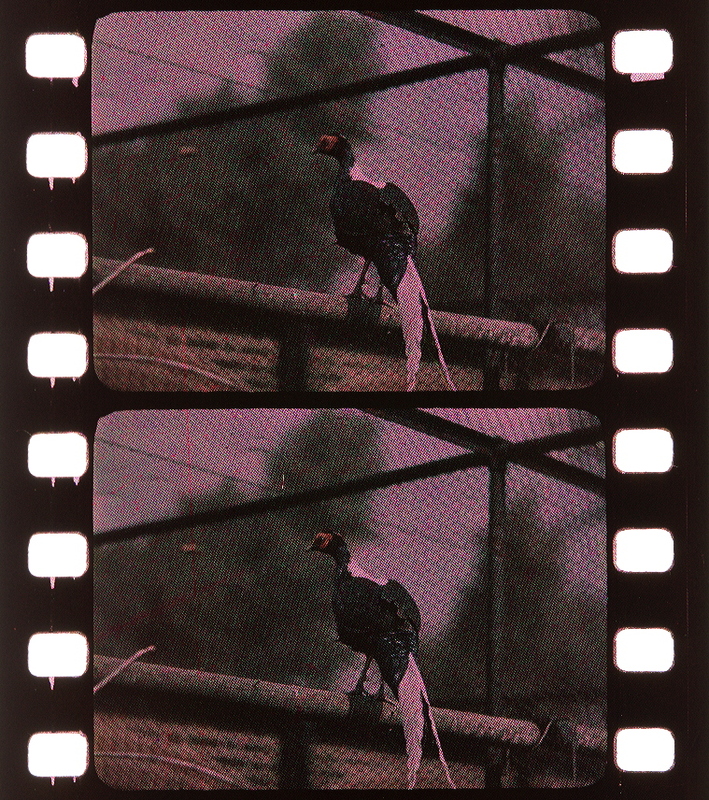 Photographs of the safety print by Michelle Beutler, ERC Advanced Grant FilmColors. 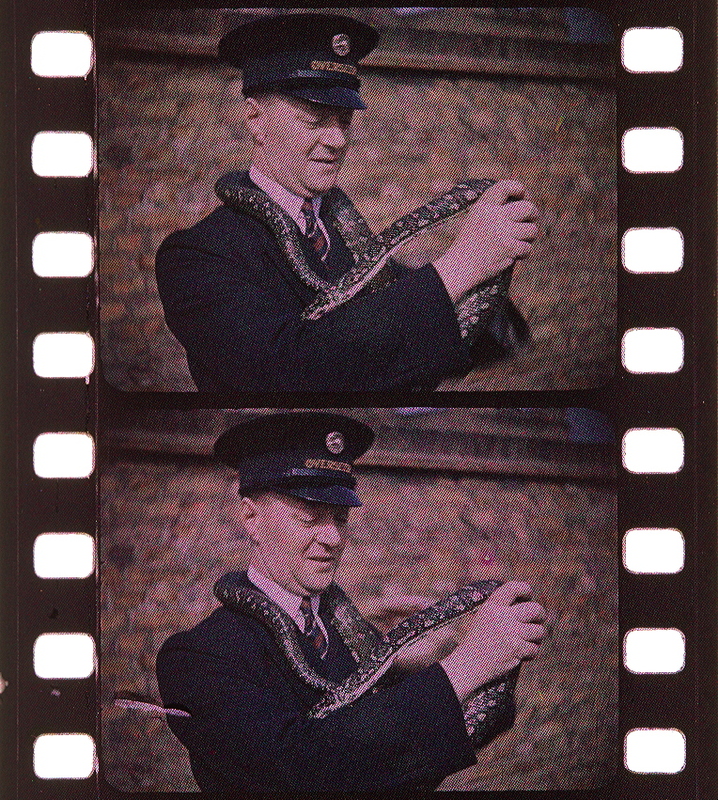 London Zoological Society (GBR 1931). 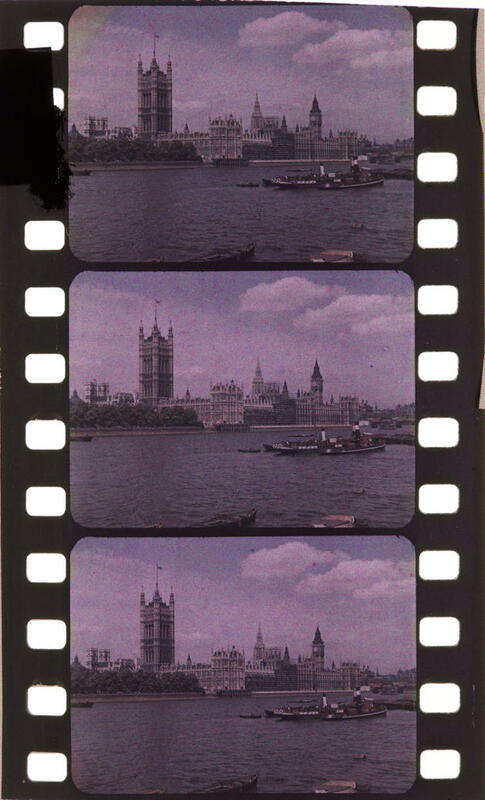 Credit: BFI National Archive. 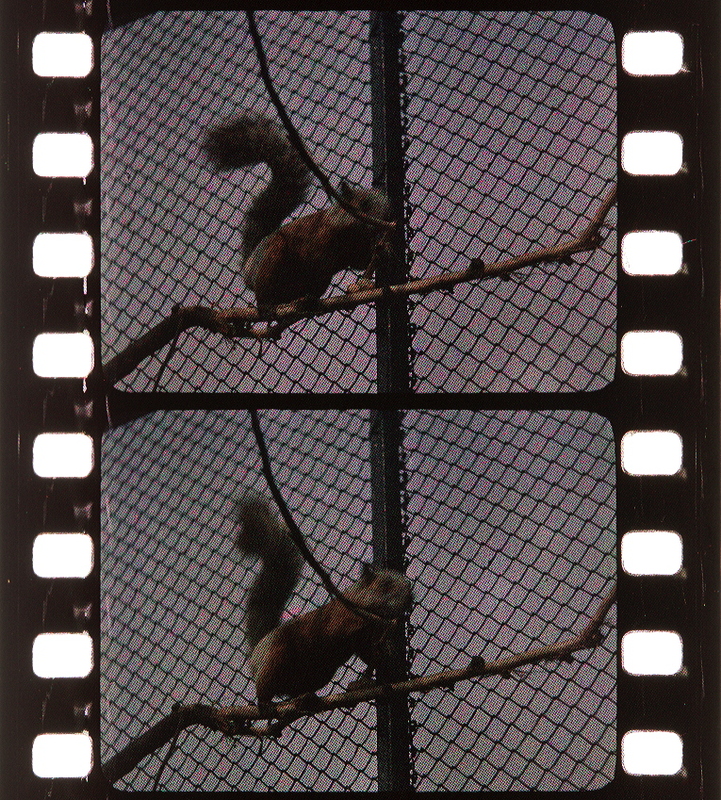 Photographs of the safety print by Michelle Beutler, ERC Advanced Grant FilmColors. Uit het rijk der kristallen (NDL 1927?, J.C. Mol). 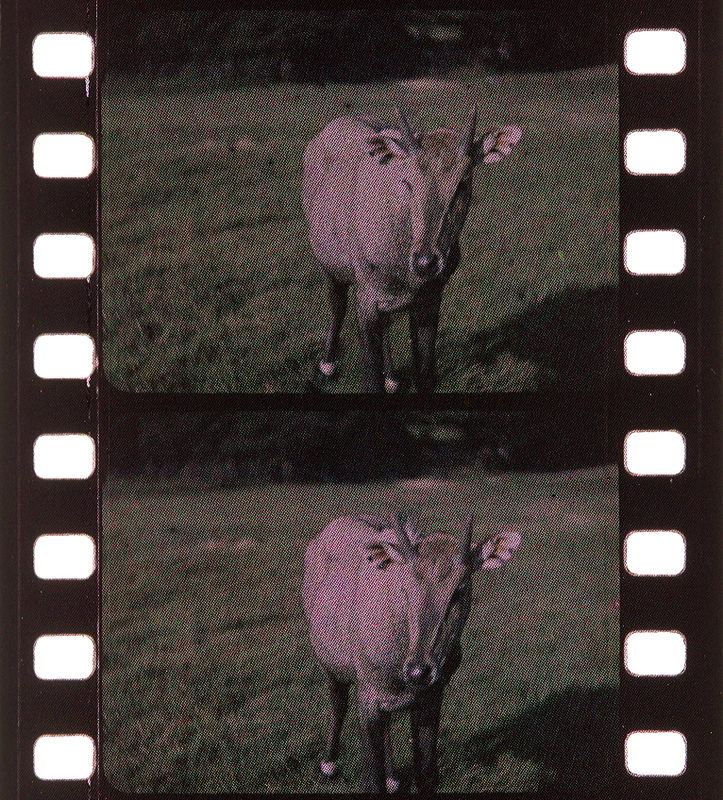 Credit: EYE Film Museum. 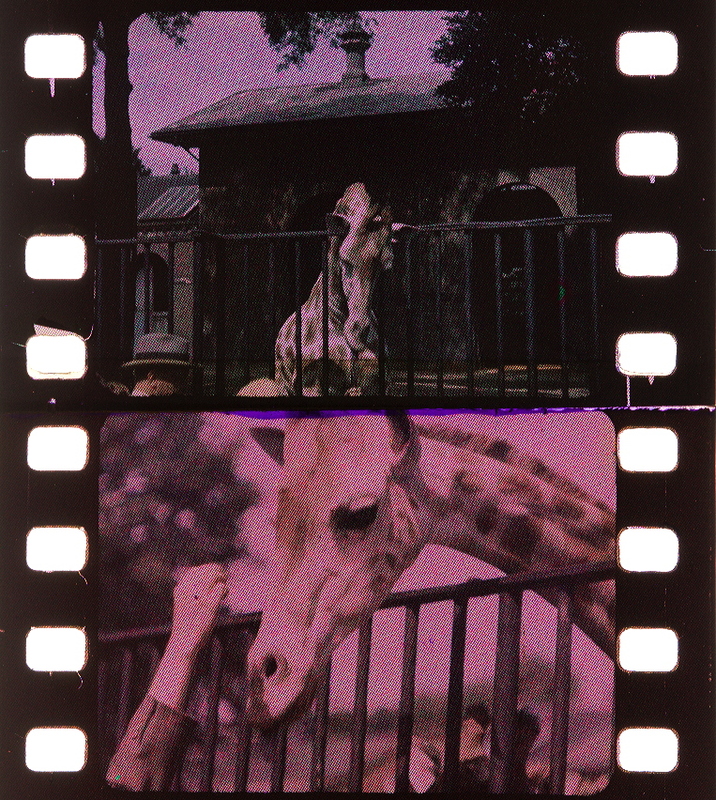 Photographs of the safety print containing two different color processes by Olivia Kristina Stutz, ERC Advanced Grant FilmColors. The parts with the light brown perforation area and the line screen (réseau) are original Spicer-Dufay, while the parts with the black border must have been printed in Gasparcolor later. Uit het rijk der kristallen (NDL 1927?, J.C. Mol). 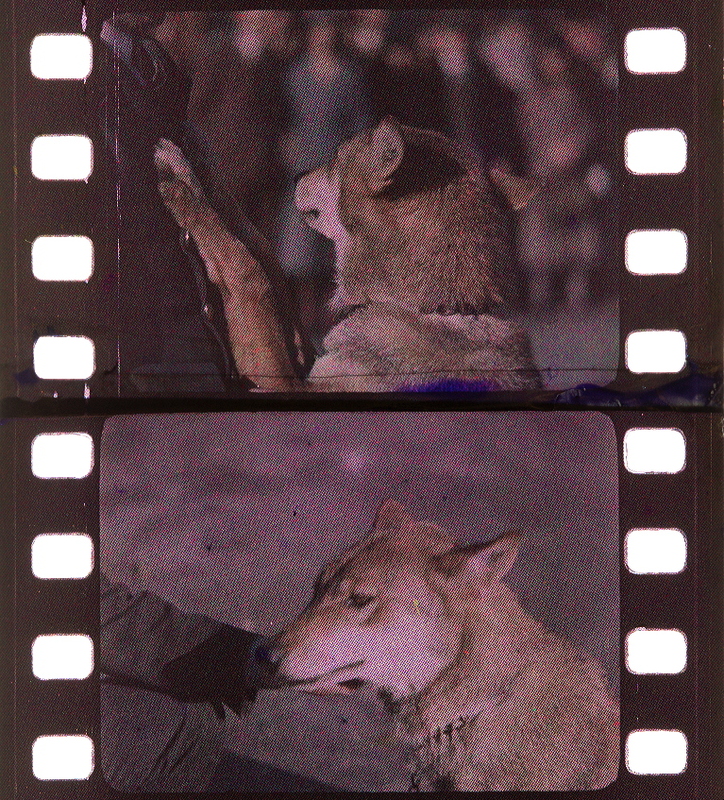 Credit: EYE Film Museum. 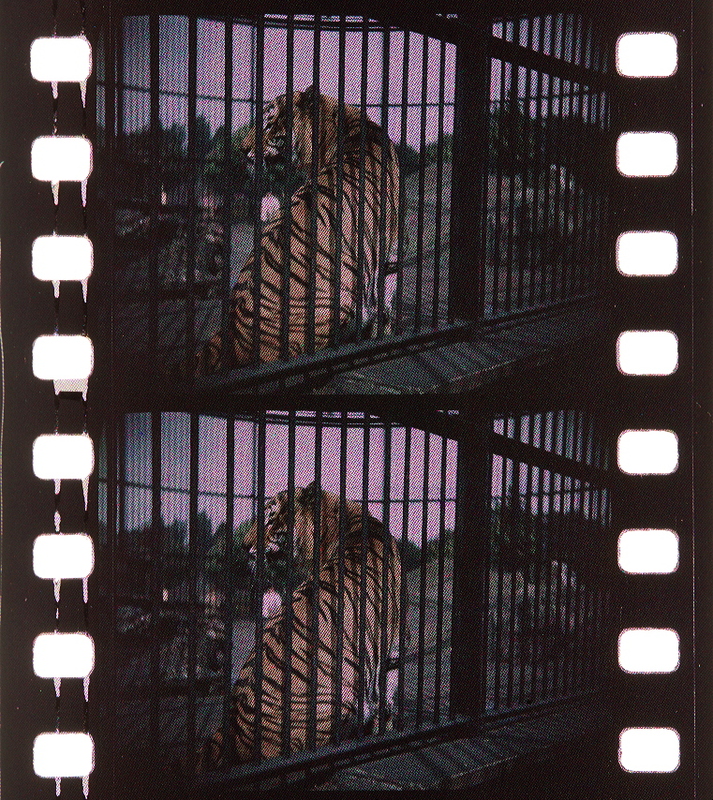 Photographs of the safety print by Olivia Kristina Stutz, ERC Advanced Grant FilmColors. 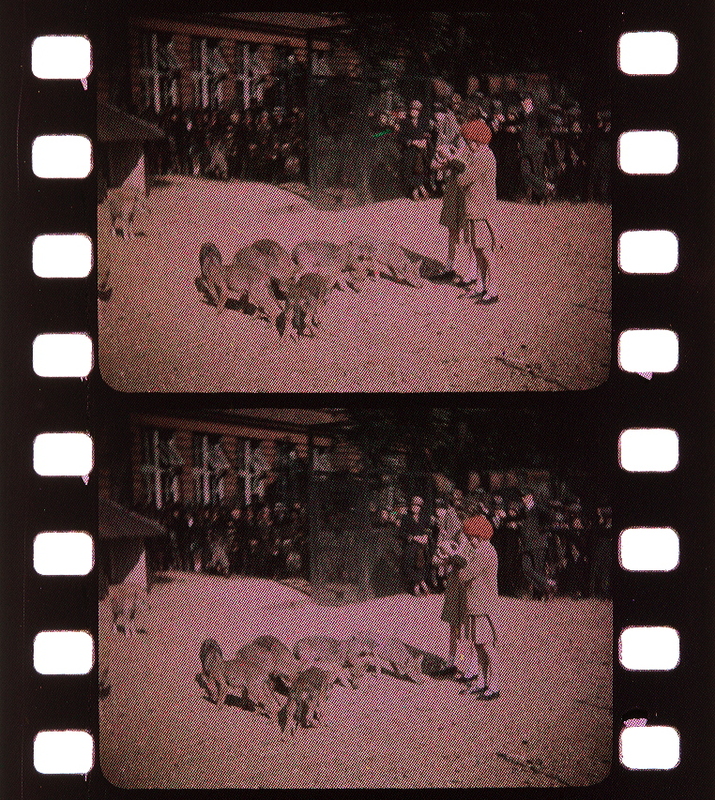 Thorne Baker, T. (1932): The Spicer-Dufay color film process. In: Photographic Journal, 72, 109, pp. 109-117. By T. Thorne Baker, F. Inst. P., F.R.P.S., A.M.I.E.E. At the meeting of The Royal Photographic Society on November 3rd, 1931, with the President, Mr. Olaf Block, in the Chair, a demonstration was given by Mr. T. Thome Baker of the Spicer-Dufay colour film process. The President said that Mr. Thorne Baker was about to bring before the Society a process of colour kinematography, and it was easy to tell from the large attendance that evening what great interest was taken in such a process. 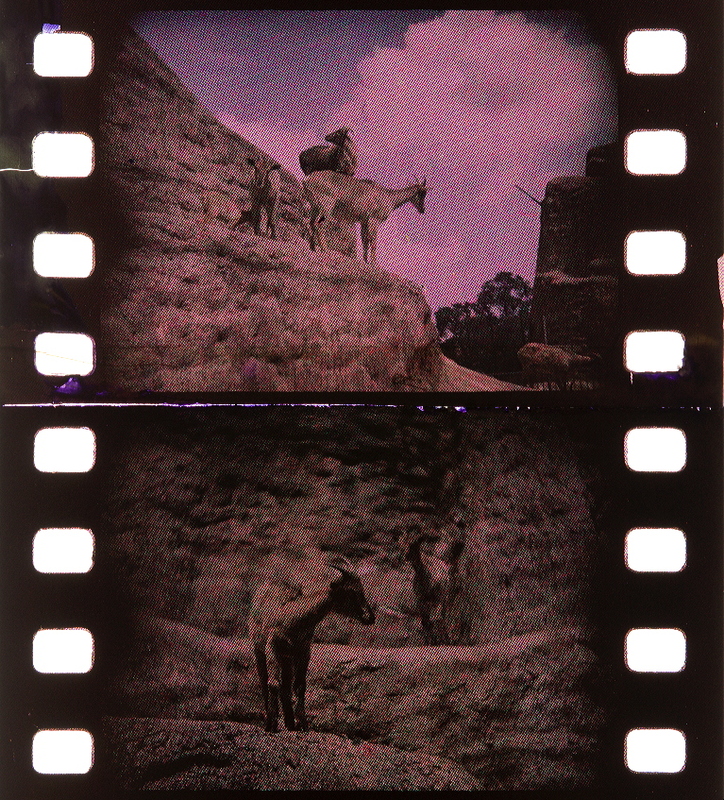 Many attempts had been made at natural colour photography, both in the way of transparencies and prints and kine colour, innumerable patents had been taken out, much research had proceeded, and much money had been spent on this quest for many years. 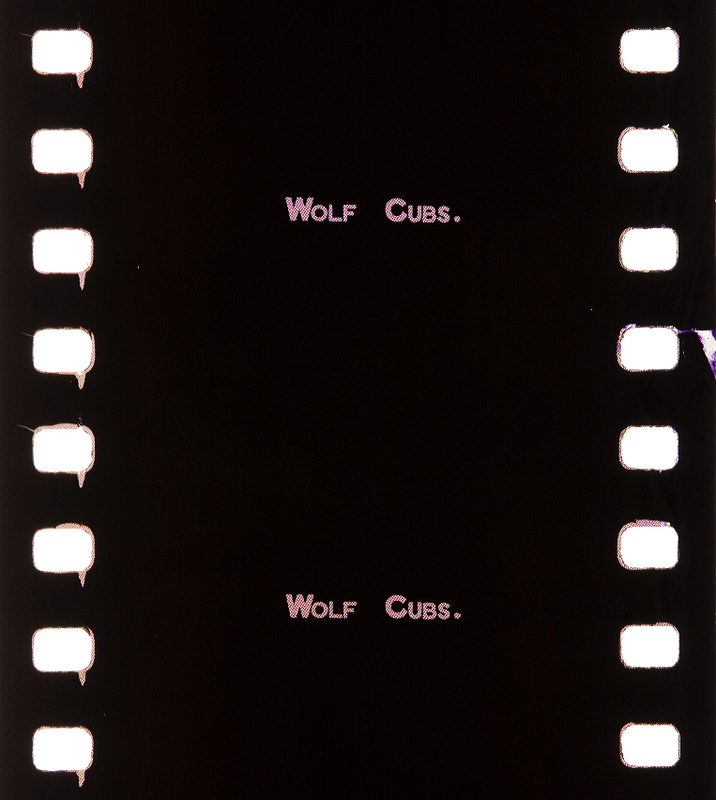 Yet a successful process, which could take its place in the regular run of kinematograph work, had still to be found. 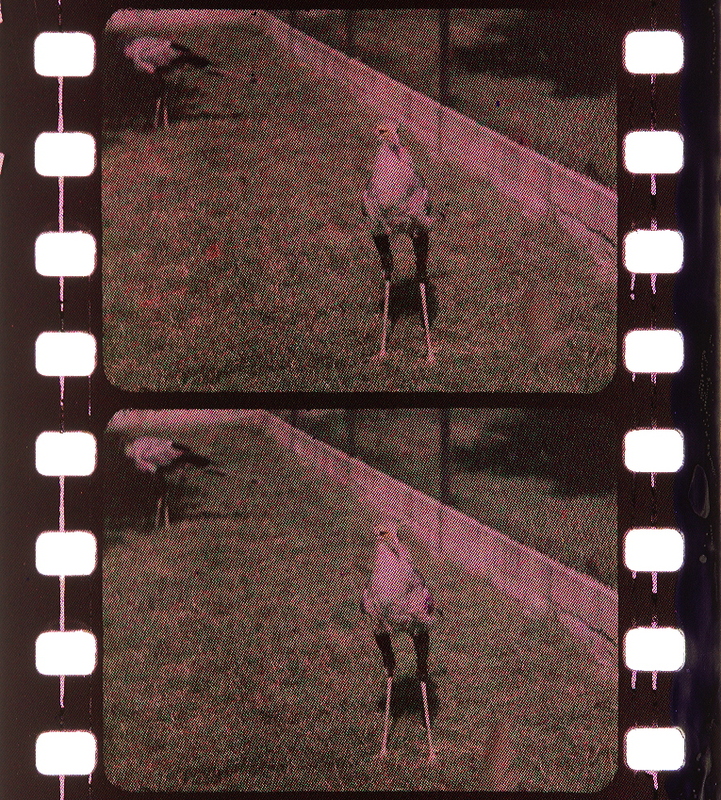 Mr. Thorne Baker was going to show that evening another development which, Mr. Baker believed—and they hoped his belief would be found to be substantially based—would find a place in the public displays of the kinematograph. THE history of the screen plate as a means of obtaining photographs in natural colours is too well known to need any consideration to-night. The first patent protecting the principle of a matrix of juxta-posed minute areas of colour was undoubtedly the French one of Ducos du Hauron (1). It has been stated that the pattern of the coloured elements plays an important part in the manufacture of screen plates (2). I think that the pattern has to-day proved to be of little importance as far as the result is concerned. 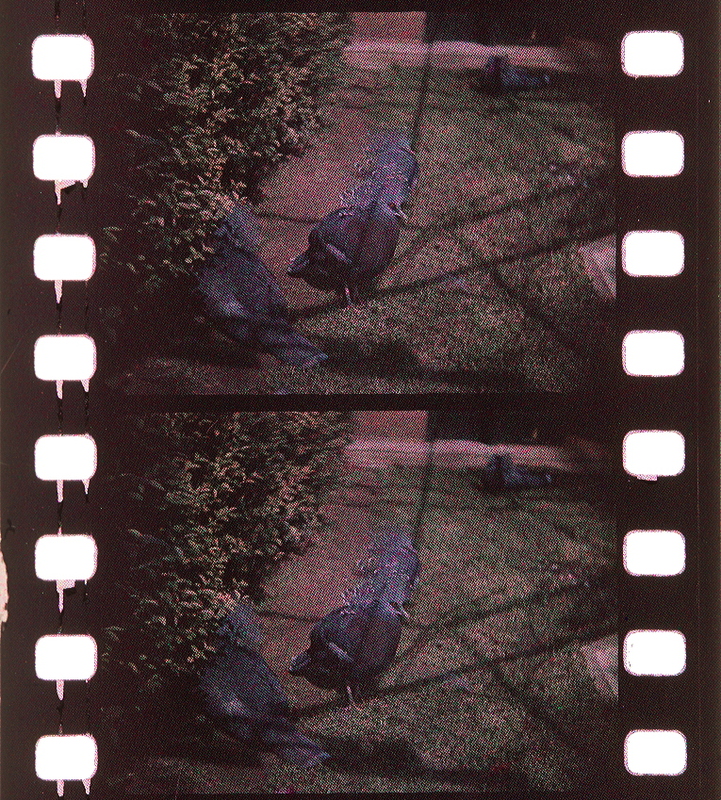 If we compare a really perfect example of a colour picture taken on an Autochrome, an Agfa plate, a Finlay plate, or on the Spicer-Dufay film, they may be all apparently perfect, and if examined from a distance of, say, 18 inches, when suitably illuminated, the average eye would be quite incapable of differentiating between the geometrical or irregular pattern of the coloured elements. An important point in connection with the matrix is that the relative areas occupied by the three coloured elements must be very accurately balanced. Where irregular screens are employed it necessarily happens that masses of red, green or blue units occur together like small bunches of grapes, and, although there are certain limits of tolerance which have been agreed upon, it is obviously more conducive to perfect results if we have the three primary elements effectively and regularly broken up into the smallest possible dimensions. In this way a geometrical matrix has a great advantage over the irregular pattern. 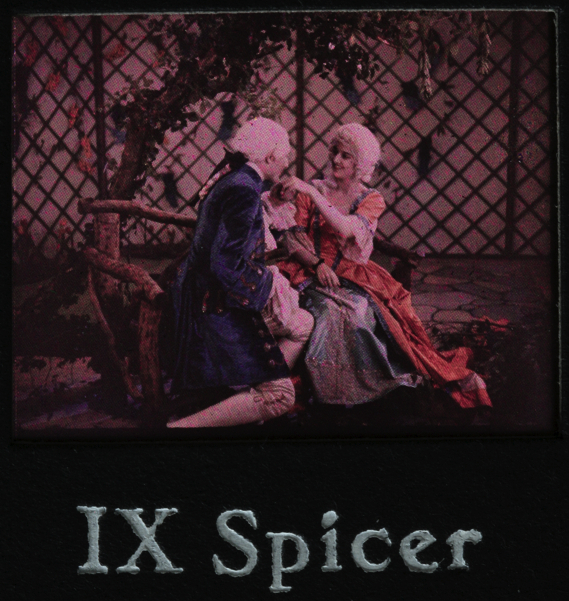 Before entering into details of the physical character of the Spicer-Dufay film, it may be interesting to give a brief account of the way in which it is produced. 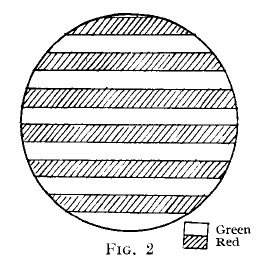 The idea of applying a series of coloured lines or squares to the film base, originally suggested by Vidal (3), has been used by Dufay, and in this system two processes are involved, one of which provides a series of alternate green and red lines a fortieth of a millimetre in width and perfectly contiguous, the other a further set of lines at right angles in blue-violet. The use of a greasy resist in carrying this idea into effect was first suggested by du Hauron and Bercegol (4). 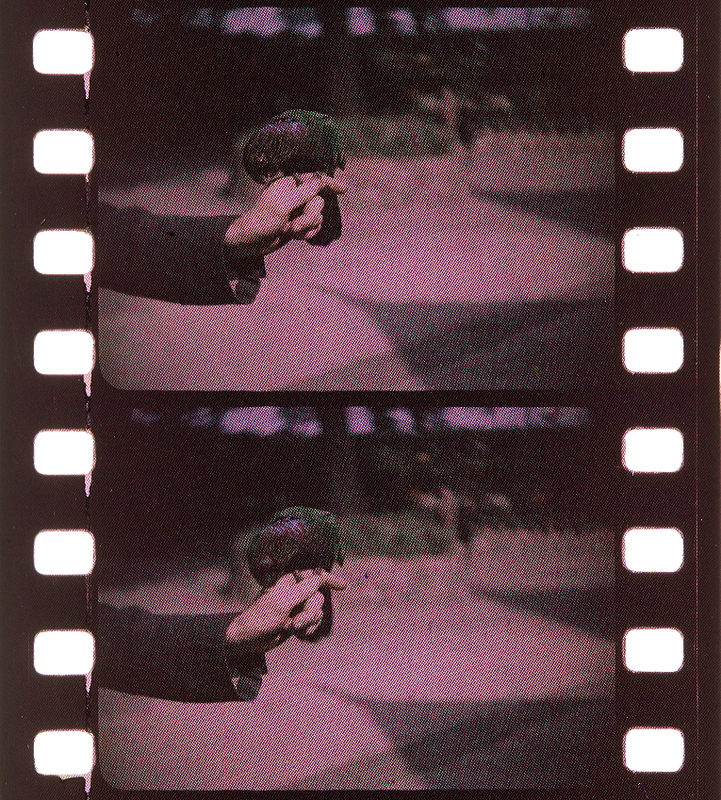 The film base is first coated with a very thin layer of collodion containing a green dye; the depth of this dye is adjusted to be that of the green primary. The work of the last five years has been on the non-inflammable acetate base made by Spicers, Limited, at their factory at Sawston, Cambridgeshire. 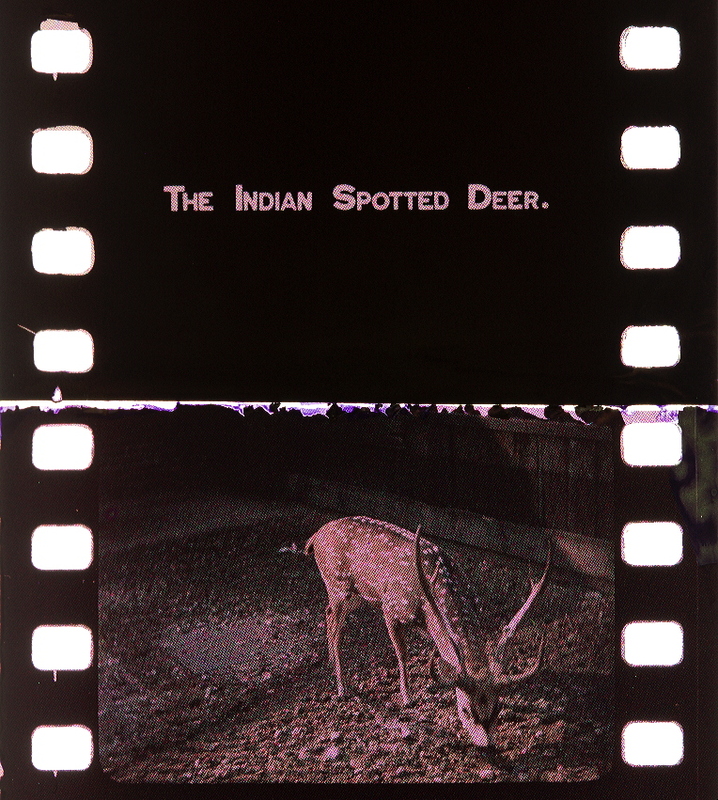 This film, 21 inches or 42 inches wide, is then passed in one-thousand foot lengths through a special type of rotary printing machine, consisting of one heavy steel roller milled with five hundred lines to the inch with an elaborate system of ink distribution, and an underneath heavy rubber-coated roller in contact with it. 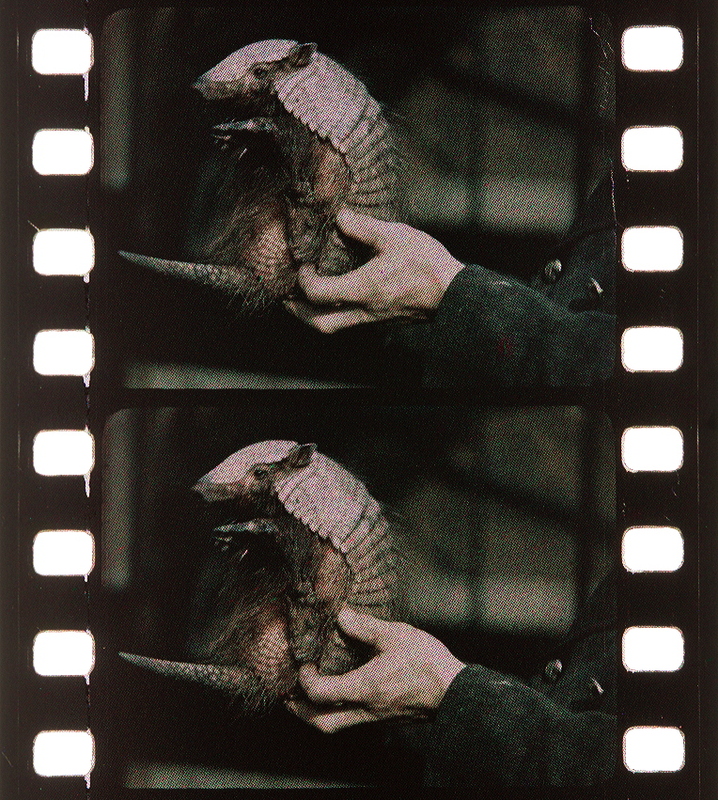 On passing through this machine the film emerges with five hundred lines to the inch printed on the green collodion; the ink is excessively thin—far below what would be used in typographic printing. In spite of the extreme fineness of the layer, however, this printing ink, after an hour’s drying under selected conditions of temperature and humidity, sets to a semi-dry state in which, while the edges of the lines remain substantially parallel, no creep takes place, and on passing through a bleaching bath of alkaline-alcohol, the ink acts as a perfect protection, allowing bleaching to take place only in the unprotected parts. Fig. 1 shows the arrangement. 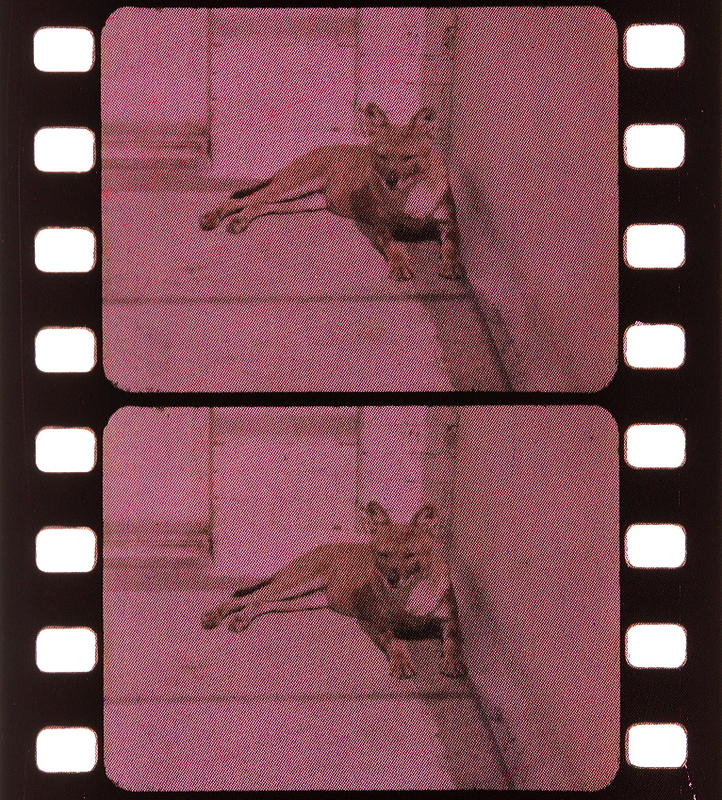 The printed film passes first through the bleaching bath; then—without washing—through the second bath, which contains the primary red dye. 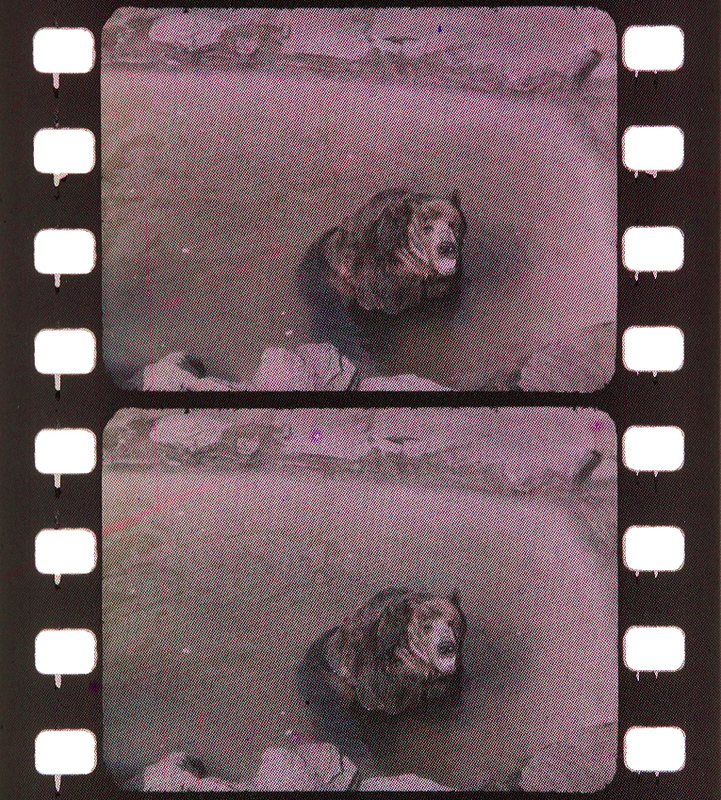 The concentration of this bath is such that during the time of travel through it of the film, the collodion becomes dyed to the necessary degree of saturation. Here again the strict maintenance of the correct concentration and temperature is necessary. 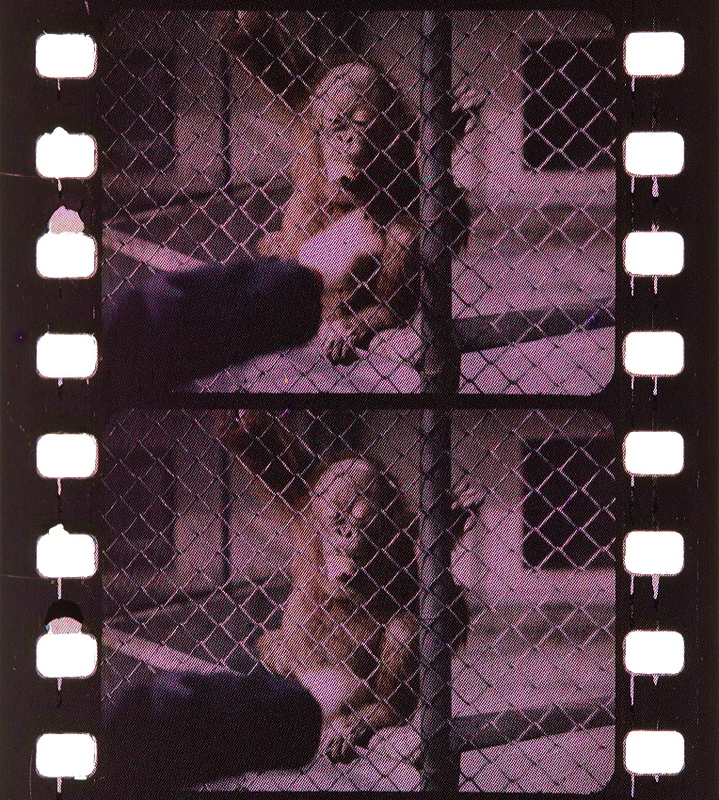 On emerging from the red dye bath, the film passes through a series of tanks containing benzol, which remove the printing ink, so that when the film leaves the cleaning tank we have a series of red lines stained in between the green lines, which have been protected throughout by the greasy printing ink. 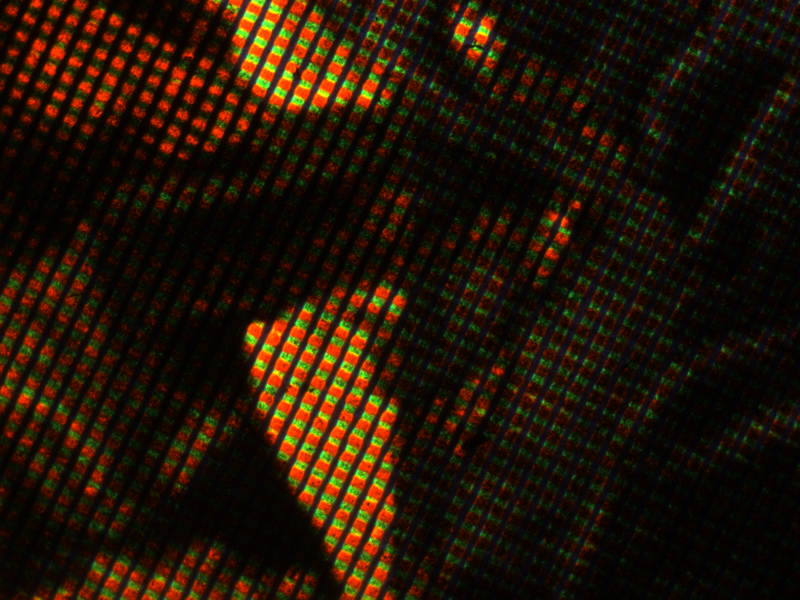 A photo-micrograph of the matrix at this stage is seen in Fig. 2. 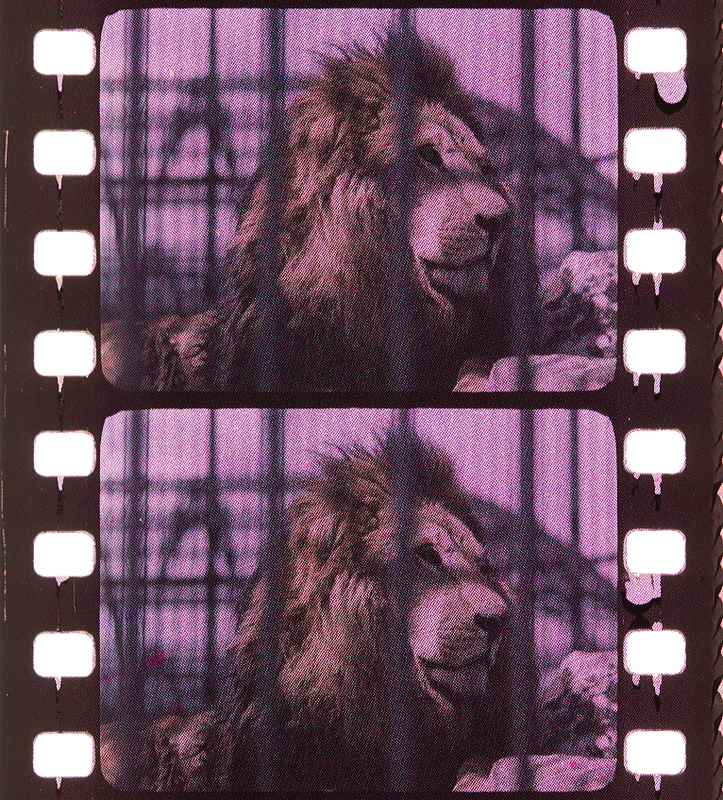 On leaving the machine the reel of film is turned over to a second machine, in which the whole cycle of operations is repeated, the lines in this case being at right angles to the first series and the dye used for the bleached-out spaces being the blue-violet primary. 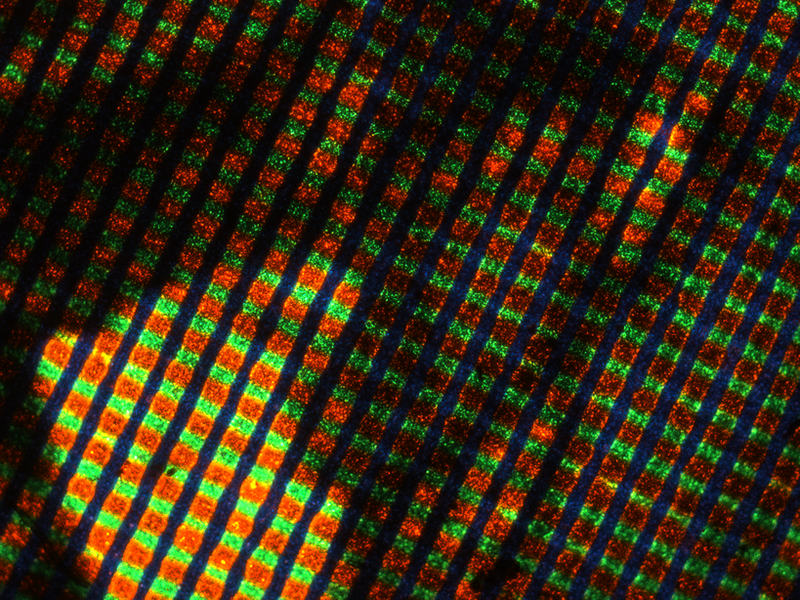 At the end of the cycle the film is thus covered with a chessboard pattern of blue, green and red squares, a photo-micrograph of which is shown in Fig. 3. You will notice that in this example the squares are more or less equal in size. This is a piece of matrix made three or four years ago, and a great deal has taken place since that time. To-day the red squares are considerably bigger than the green, and the blue-violet primary takes the form of a single line, rather a thin one, between each series of green and red alternations. The width of the printed resists can be adjusted with exquisite delicacy by means of special mechanical refinements which we have worked out, and the balance of the three primaries can thus be controlled with precision. This completes the preparation of the matrix; the next step is to coat it with emulsion—theoretically in optical contact. This desideratum cannot be observed for two reasons; one is that, owing to the desensitising properties of the dyes used, the matrix must be separated from the emulsion by an insulating layer. 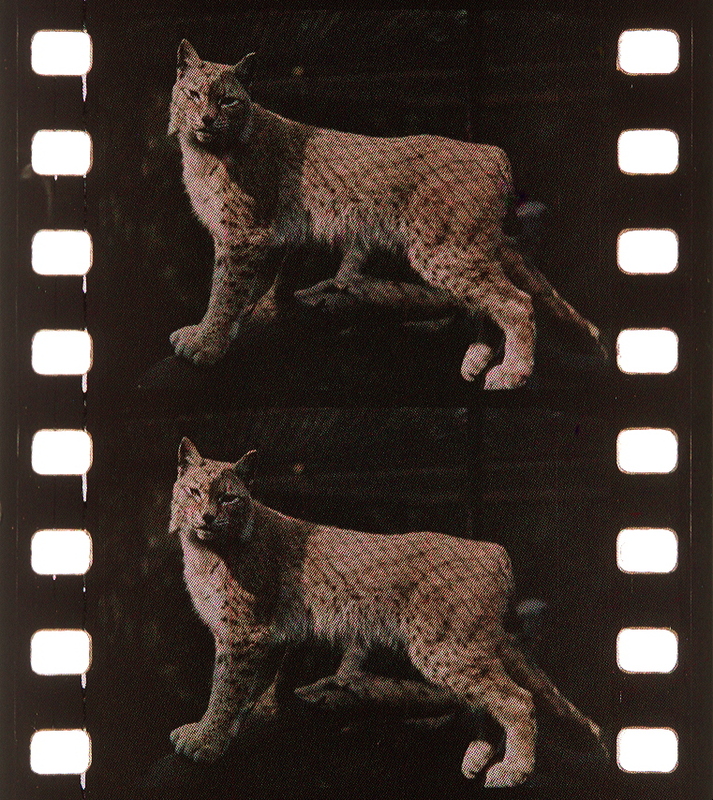 The other is that our process of printing or duplicating the originals depends to some extent on the fact that the colour matrix is separated from the silver image by such a distance, that, when the latter is sharply focussed on a copying film, the matrix itself is slightly diffused. 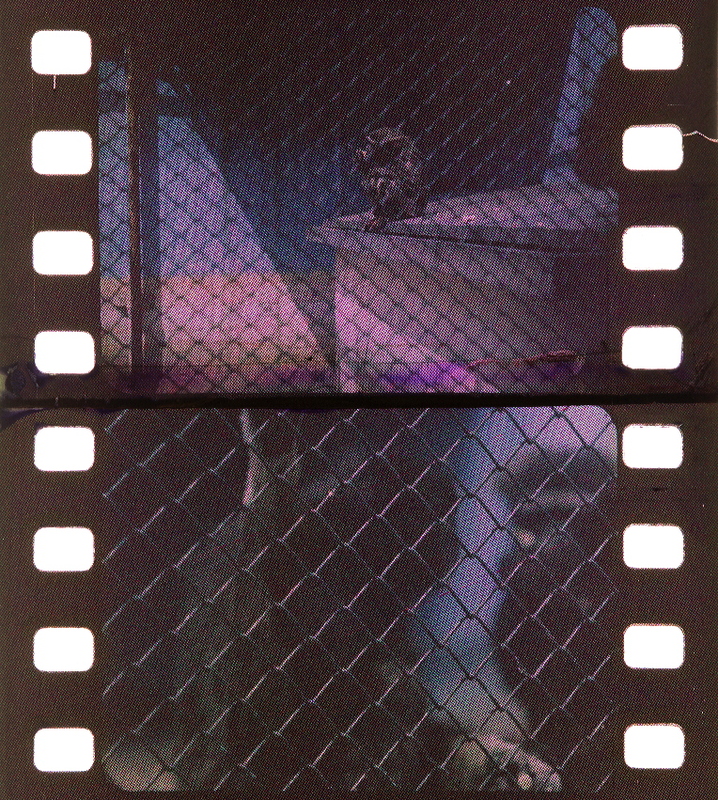 The film is first coated with a layer of gelatin about 3 μ in thickness and over this is coated a layer of nitro-cellulose varnish of about the same thickness. The latter contains its own substratuming medium, so that immediately on top of it the sensitive emulsion can be coated. The emulsion itself needs some description. It is necessary for it to be capable of giving intense blacks, so that any coloured area in the matrix can be blocked out and so prevented from taking part in the formation of an additive colour of which it is not a component. The layer of emulsion must also be extremely thin. On the other hand it must be rich enough to prevent halation and irradiation, while its opacity must be such as to give the requisite amount of latitude in exposure. 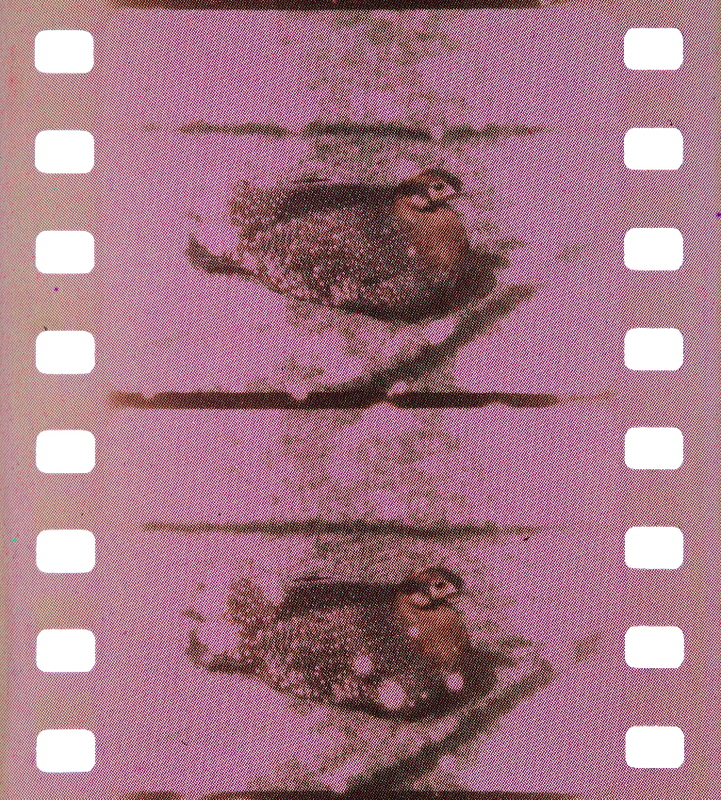 These various characteristics made it necessary to work out a special emulsion, and, as for commercial kinematographic work the speed had of necessity to be the maximum, the grain size is necessarily more than one would elect to use if actuated only by the desire to produce the most perfect results. A concentrated emulsion has, therefore, been adopted in which the silver content is about 85 per cent, that of a commercial rapid emulsion. 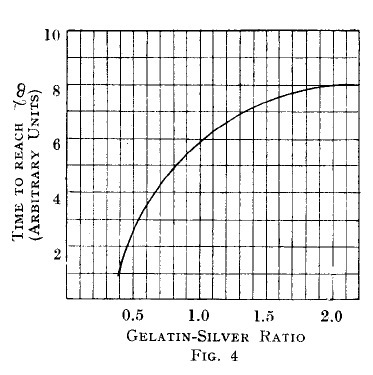 By reducing the gelatin so that the ratio of gelatin to silver is only about 0.9 to 1, the bulk of the emulsion has been contracted into the smallest possible space. 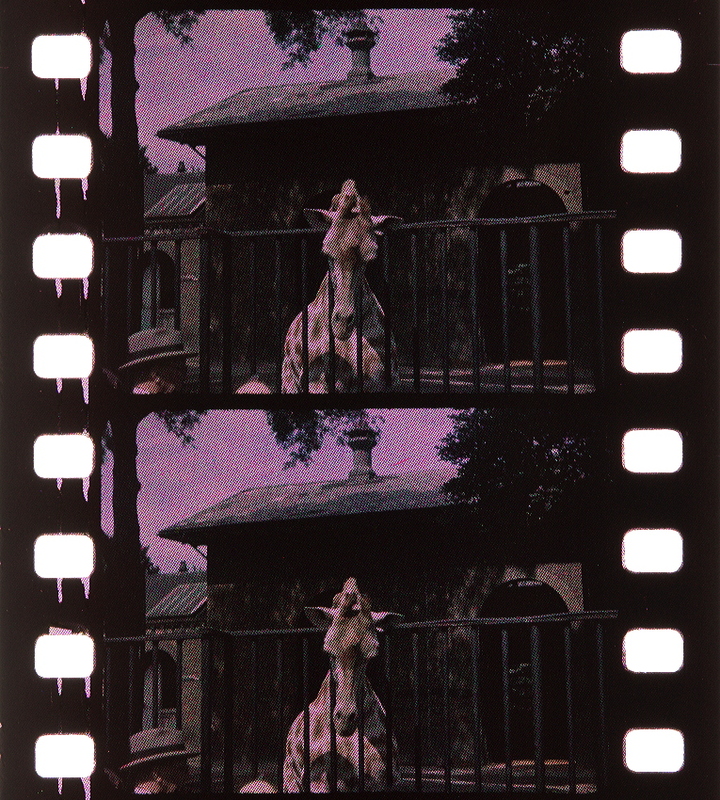 In spite of the low gelatin-silver ratio the emulsion keeps remarkably well, and film stock prepared this way can be used up to nine months after preparation. The speed of the emulsion to electric light (gas-filled lamp) is about 4,000 H. and D.
I will diverge here for a moment to deal with that old and vexed question of the effect of wavelength on gradation. In a communication to the Faraday Society (5) I endeavoured to show that the effect of wave-length on gamma is negligible, provided it be measured at gamma infinity. In other words, if development is complete in the chemical sense the contrast remains the same at any wavelength throughout the visible, or ultra-violet, and X-ray spectrum. Mees and Sheppard concluded that an alteration in wave-length with the incident light does not affect gamma infinity (6). You will thus see that if we can afford to develop our image to gamma infinity we are not going to be disturbed in the balance of the picture by the effect of wave-length. 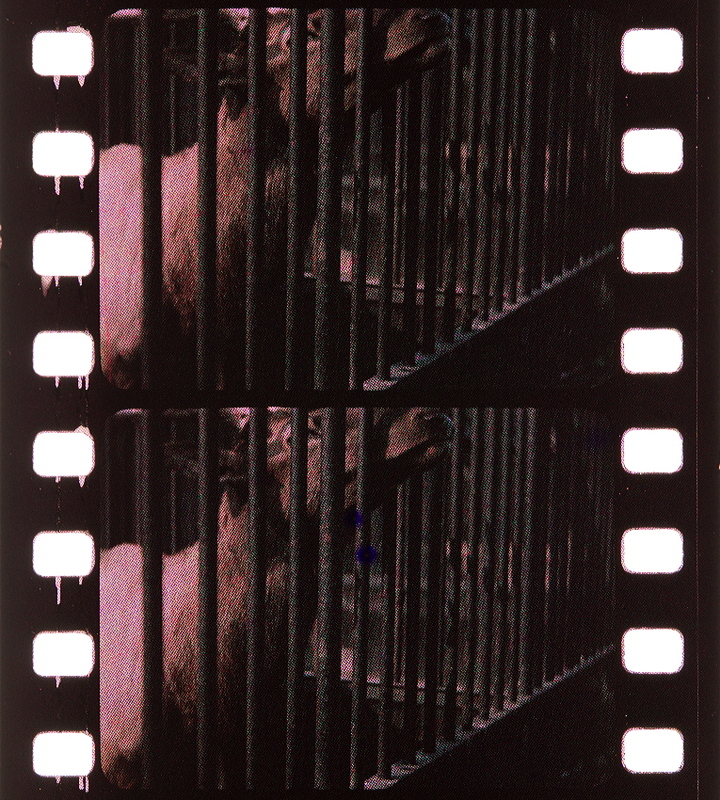 I would like to emphasise the point that any photograph taken by a screen process is in reality a composite of three photographs, any one of which may retain an entirely distinctive individuality. Failure to bear this point in mind may easily lead to difficulty when dealing, not so much with originals, but especially with copies. You will see from Fig. 4 the benefit we obtain from what the emulsion maker would probably think a bad feature—namely, the low gelatin-silver ratio. This curve, which i s diagrammatic only, shows the approximate effect of reducing the amount of gelatin used with a given amount of silver in a fast emulsion. As the gelatin is reduced, gamma infinity is reached very quickly, and in our case the normal development which we give to studio or outdoor shots provides automatically that gamma infinity has been reached. This feature necessitated a good deal of work from another standpoint. In the minds of most photographers gamma infinity is synonymous with a very hard result. 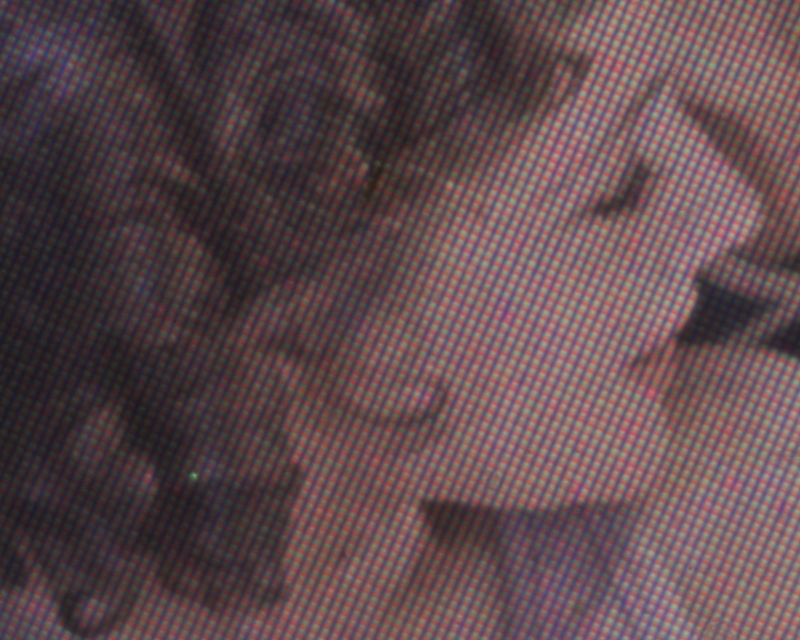 In any colour screen process, in order to get the delicate intermediate hues, it is essential that the emulsion should possess the widest possible scale of gradation. It must be contrasty, but it must have a very long straight portion to its characteristic curve. You will see from a typical test chart of our own emulsions (Fig. 5) that, while gamma is high, the characteristic curve has hardly any foot, and this indefinitely long straight portion provides the extraordinary latitude to which our camera men testify. 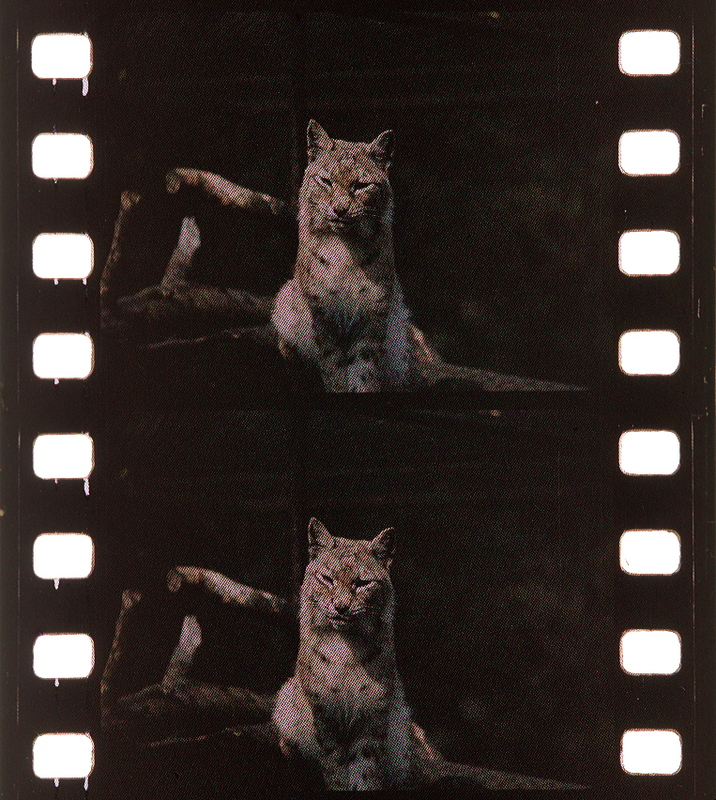 Even with special treatment in the process we do not claim to have the latitude of 1 to 16, stated recently to be possible with the Agfa plate by Rahts and Schultz (7). 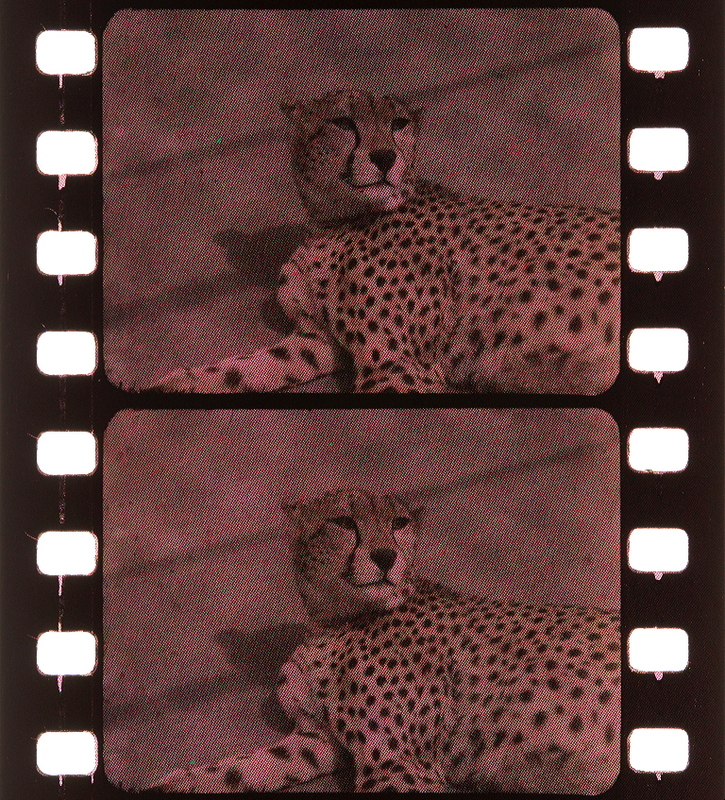 We certainly have got a latitude of 1 to 3 in overexposure or 1 to 1/3rd in under-exposure, a total range of 1 to 9, which is greatly in excess of what is necessary in commercial practice in the kinematograph studio. The benefit of such great latitude will, of course, be felt in due course in amateur roll film and flat film work. Apart from the effect of wave-length on gradation, we must also consider the effect of wavelength on the resolving power of the emulsion. 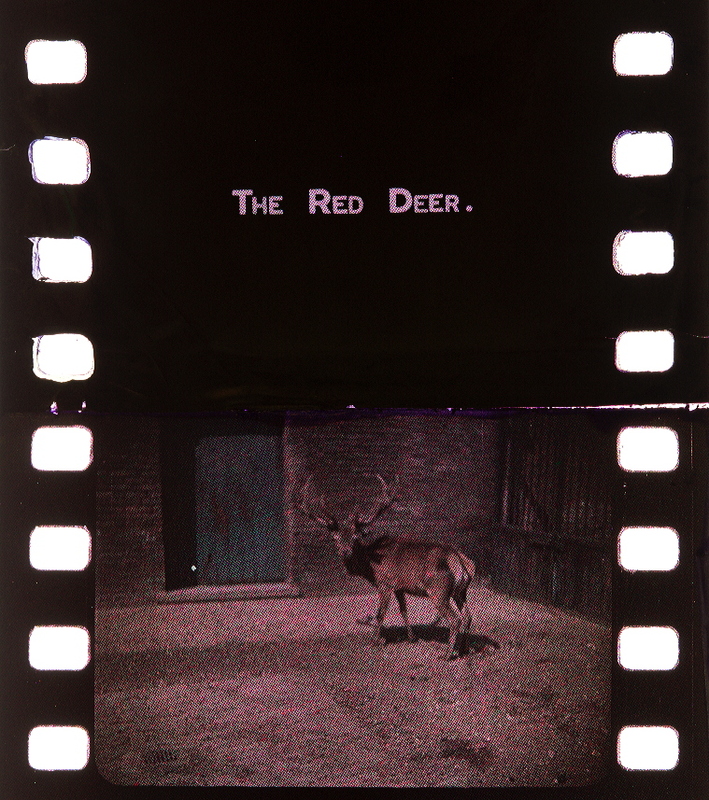 With the very high magnification which takes place in kinematography it may easily be observed that the definition on the screen is much worse in blue objects than it is in red. Mees (8) found that the resolving power of an average plate was doubled when using red light (as against blue). In accordance with his work, and with that of Scheffer (9), I have found that the emulsion, apart from having very low gelatin-silver ratio, must have very low turbidity, coupled with the greatest possible opacity, if it is to give homogeneous resolution in the three primary regions. The primary filters we use vary considerably from the accepted standards. Here again I do not wish to introduce controversial matters, but I would like to state that we have more or less adhered to the transmissions suggested by me at this Society in 1905 (10). 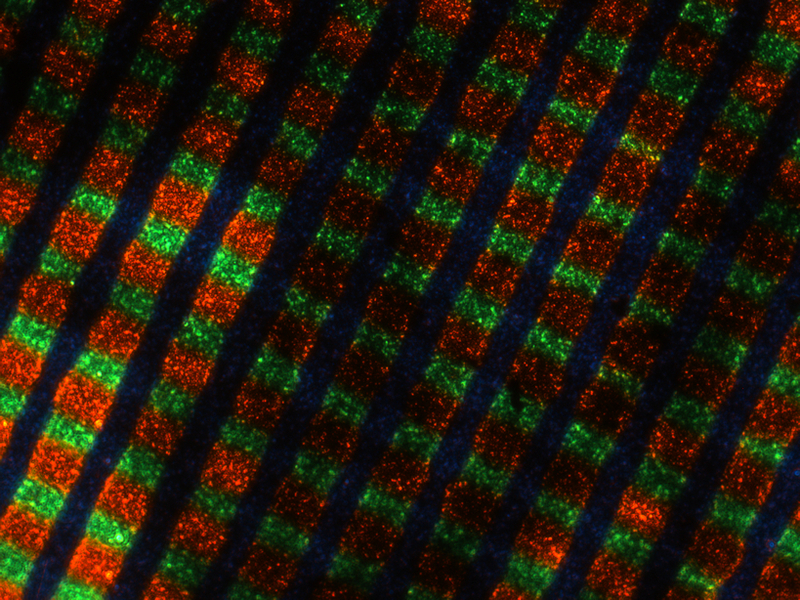 In these filters the blue-violet merges into the green, extinguishing in the middle of the green transmission; the green begins in the middle of the blue-violet transmission, and tails off into the middle of the red transmission. Mees and Pledge (11) thought for an additive process the filters for taking the negatives should overlap in the green and red, and in the blue and green, and they should be sharp cutting, whilst for viewing and projecting they should be comparatively narrow and should not overlap, and that for a reversal process a compromise should be effected, and filters of sharp cut with edges overlapping or not overlapping at all should be selected. I can only say that, as the result of experiments in additive colour photography during the past 23 years, I still believe that the spectrum should be treated geometrically as shown in the diagram (Fig. 6), and that each primary should half overlap the adjacent one, gradually tailing off to zero half-way through the field of the adjacent filter. Brasseur (12) on the other hand has suggested very narrow regions of the spectrum for the taking elements, and overlapping ones for the viewing elements. We, too, have tried this effect, but using transmissions far more exaggerated than those cited by Brasseur in his specification. It has given admirable results. The conclusion I have come to is that Mees and Pledge, Brasseur, Spicer-Dufay, and many others, are all perfectly correct; in other words, that the latitude one has in the method of splitting up the spectrum for additive three-colour work is nothing short of amazing. Fig. 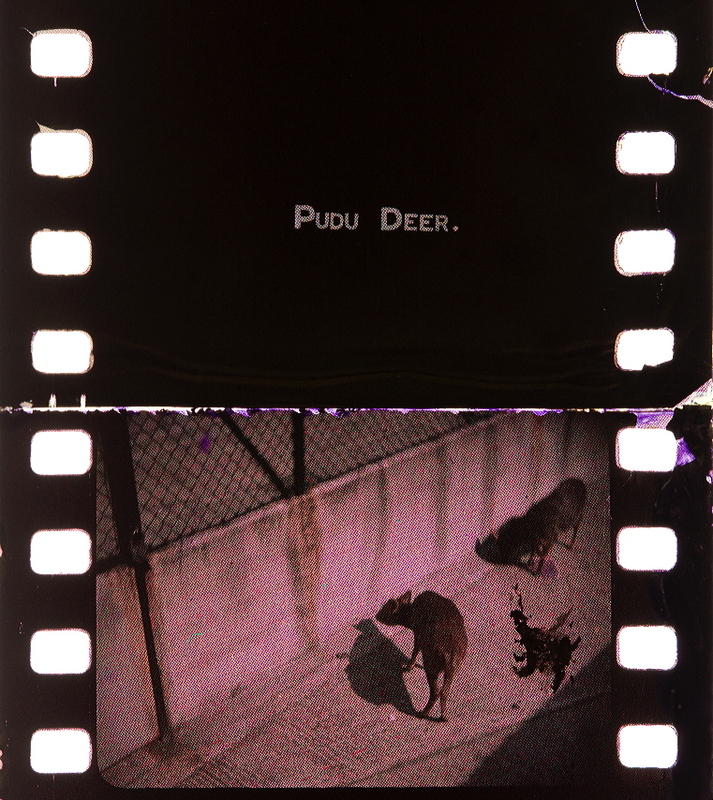 7 shows the Spicer-Dufay primaries as against the synthetic primaries supplied by Kodak, Ltd. One would at first sight say that the overlaps were altogether wrong. How wrong or right they are, I think, must be judged from the results, and when you see the accuracy of the colour rendering, which is well maintained on reproduction, I think you will admit that in operation these filters satisfy the eye. The amount of light absorbed by the colour matrix is, of course, reduced by these big overlaps: it has been cut down to about 75 per cent., i.e., 25 per cent., of the incident light gets through the matrix to the emulsion. I note that measurements made some years ago by Mees and Pledge (13) showed the average transmission of screen plates to be round about 10 per cent., although the Dufay was at that time stated by them to transmit 21 per cent. The exposure is developed and reversed by well-known methods which we need not discuss here. It is interesting, however, to note that, taking three developers at random—hydroquinone-soda, paraphenylenadiamine – hydrochloride – caustic soda, and metol – hydroquinone ammonia—the exposures required to give the same result are in the ratio of 4, 2 and 1 respectively. There is no doubt that increase in the amount of silver bromide solvent in the developer greatly reduces the degree of exposure necessary. Our standard development is one of approximately eight minutes with M.Q. ammonia of rather high concentration at 65° F., and in studio work the light is arranged so that whatever exposure is given this standard development can be carried out. In daylight we, of course, make use of the iris diaphragm, the aperture varying from f/1.8 to f/3.5 or even f/4.5, according to the light. 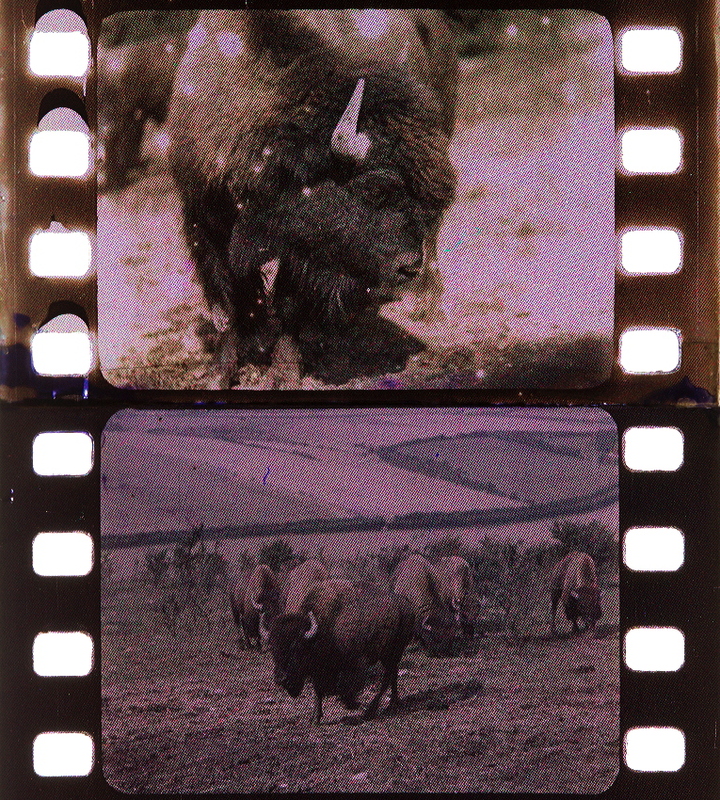 If the exposure can be so arranged that the standard time of development can be given, the average result of work with the Spicer-Dufay film is an output of practically 100 per cent, good pictures. I think this point of processing might throw a useful leader to amateurs interested in colour work. It must, of course, happen on occasion that development has to be varied owing to the impossibility of giving the correct exposure, and Fig. 8 shows the effect of increasing time of development. It will be seen that as the time increases the gamma increases in the usual way, but only up to a certain point, when, owing to the low gelatin-silver ratio, the available silver is all used up. After this point the foot of the characteristic curve begins to rise, and this has actually the effect of lowering gamma, building up shadow detail, and, of course, using up what silver there is left to form the final image on reversal. Fig. 9, three simple diagrams, shows how any change in the character and density of the primary negative image must be made at the expense of the reversed image, and a further diagram (Fig. 10) shows that, no matter what the time of development may be, the positive on reversal, as far as gradation is concerned, is always a mirror image of the negative. 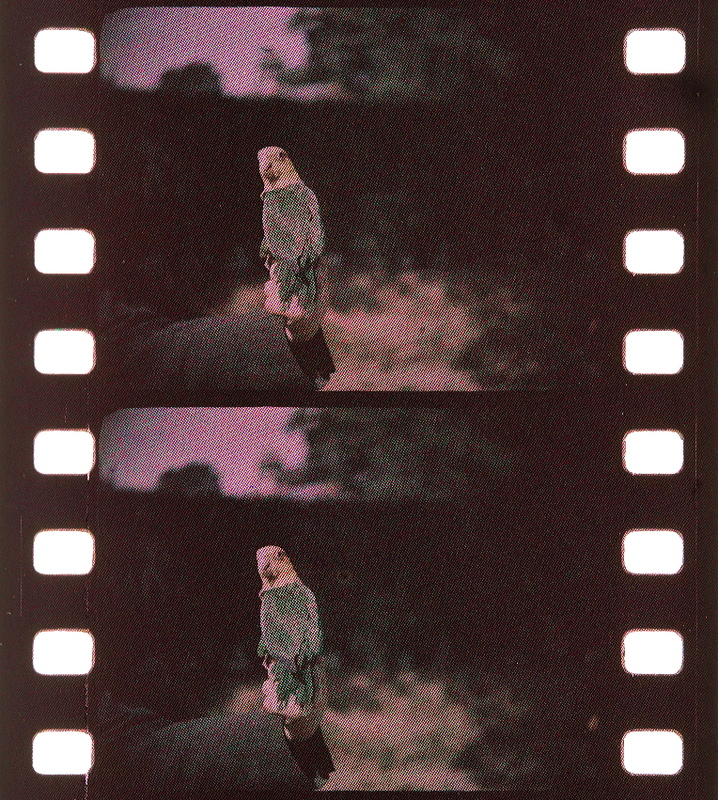 After development, and the dissolving away of the silver image by acid bichromate, the unexposed silver salts are re-blackened with ordinary metol hydroquinone developer. There is a good deal of speculation as to what modification of the results can be obtained in this second development, but unless the exposure be varied I do not think the latitude is very great. It is, of course, important that reversal be complete, i.e., that all the negative image be removed, and equally important that any silver chromate formed be removed by treatment with sodium sulphite. 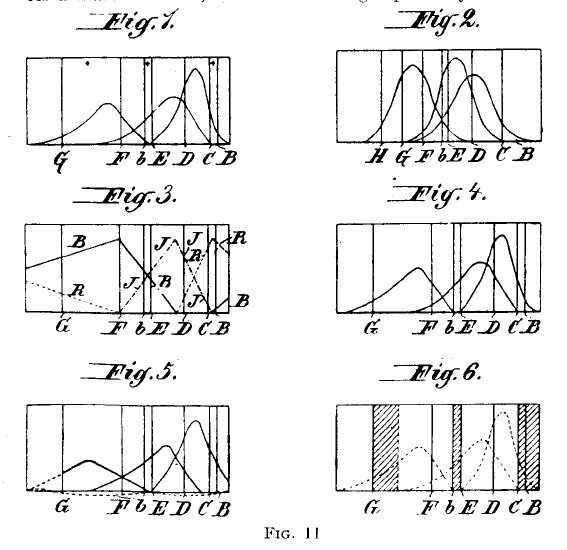 Some of the peculiar variations obtained are probably due to such phenomena as Rahts and Schultz have described recently (14); they have noticed irregularities in the high lights, and at other times in the shadows, which cause re-reversal on under-exposure; instead of the blackening declining with increasing exposure, it increases; i.e., the intensity values are rendered the reverse way round. There would appear to be an advantage in illuminating the film by light of sufficient power during the whole of the re-development. It is well known that the unexposed silver bromide after reversal consists in the ordinary way of the smaller grains of the emulsion, as these are in general the least sensitive. This is fortunate, for it means that the reversed image will be composed of the finest grains. A good deal of work has been done in the way of attempting to get still finer grain by means of special developers, such as the borax bath of Crabtree (15), or the tri-basic sodium phosphate developer to which I have drawn attention (16). When re-blackening is complete, however, no advantage appears to be gained from the use of such developers. Mr. Bloch’s recent remarks at this Society (17) confirm this point. Before dealing with the subject of copying or printing it may be interesting to state some of our experiences in the photography of both outdoor and indoor subjects. We have, I believe, learned a great deal which may be of use to photographers in the use of screen plates. 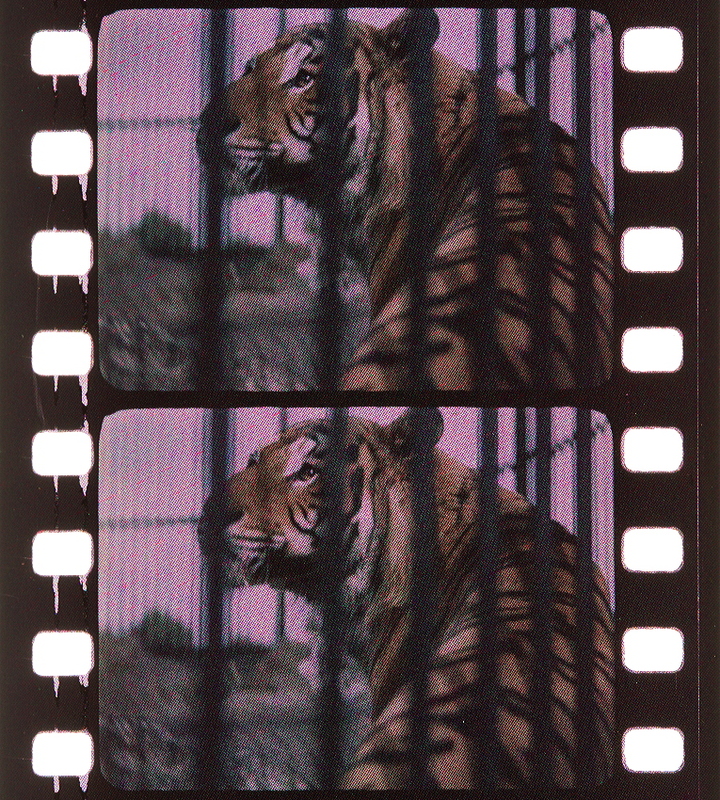 For obvious reasons, the balance of colour in the matrix and the complementary balance of colour sensitiveness in the emulsion have been so adjusted that no compensating screen is required in the studio. This statement nevertheless requires some qualification. 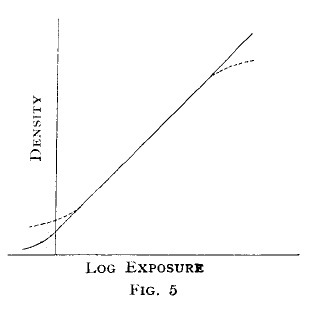 Not very long ago half-watt light alone was used in motion picture studios because it was silent, but this light varies in spectral composition very rapidly with the smallest change in voltage, and for colour work we have found that if the voltage on a 240-volt supply falls to 225 or even to 230, it has a material influence on the apparent faithfulness of the colour rendering. It has also been found that, in order to give the necessary modelling and life, arc lamps have to be used in addition. This has introduced two complications—one that the arc light contains a disproportionate amount of violet, and secondly, that practically all arc carbons are cored with mineral salts or metallic powders which give rise to a great deal of variety in the quality of the light. Bowing to the fact that a mixture of arc and electric light (gas-filled lamps) is the order of the day, we have again slightly adjusted our balance, so that in average studio lighting no compensating filter is needed. When we come to daylight the subject is far more difficult. It is, in fact, not only in this country, but even in the South of France, impossible to work all day with the same compensating filter. In trying to make a filter for use in daylight we have made use of a colour chart illuminated by vacuum lamps screened with liquid filters, as given in the Report of the Optical Society of America on the unit of photographic intensity (18). This gives mean daylight at Washington. It is, nevertheless, a fact that while a filter made under these conditions will yield perfect colour rendering in good weather in England, some modification of it is necessary in either the morning or the evening, or with certain types of cloud light. I believe, indeed, that considerable departure from a standard colour rendering must exist in pictures taken in this miserable climate, all of which may be accurate, and for this reason I venture to say that judges in selecting natural colour pictures for an exhibition should study the wide limits of colour rendering within which this real accuracy exists. Such a process as that advocated would be useless commercially unless copies could be made. Copying must be possible in the widest sense because, not only have we to produce a large number of duplicates for distribution in the theatres, but, in order to make these we have got to prepare a number of duplicate originals in order to keep the printing machines busy. The original picture, which may be developed either as a negative or as a positive, we will term “the Master Copy.” The master copy must then be duplicated, and from these duplicated masters the actual prints for distribution are made. We have found so far that the most accurate work is done if the original has been first developed and reversed to a master positive. This positive is then run through a projection printer of standard type, and copies are made by projection in the ordinary way, a very fast emulsion being used. The rate of printing is 800 a minute or thereabouts, as in the case of black and white work. Mees stated (19) that, owing to the difficulty of printing a geometrical screen plate, “there appears to be no method of reproducing our original positive except by means of Uto paper.” Even Rahts and Schultz (20) stated this year, with reference to the Agfa plate, that “owing to the irregular screen of the colour plate it is not possible during printing to bring screen grains of the same colour into exact registration and so give faithful colour reproduction; it, therefore, becomes necessary to produce a positive on the exposed plate itself.” I think that the copying of screen plates is one of those examples of the old adage “Where there is a will, there is a way,” because, faced with this difficulty which so many experts had pronounced an obvious barrier, we were obliged to set ourselves to find a solution of the problem, and, as usual, once found, this solution was extremely simple. As already indicated, the matrix is separated from the silver image by the two insulating layers of gelatin and nitro-cellulose, the two together amounting to something between 6 and 8 μ. Although, therefore, for visual purposes something sufficiently near to optical contact has been established, there is actually a substantial separation between the matrix and the silver image. 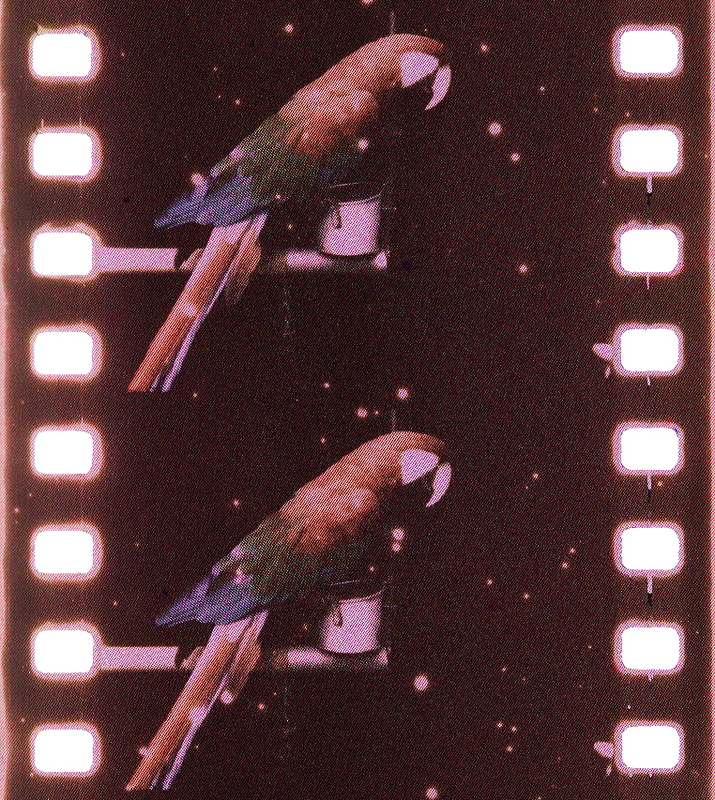 As stated by Scheffer (11), the resolved image lies only in the upper part of the film. This means that apart from the separation of the matrix from the emulsion by the insulating layer, we have the full benefit of resolution because the “upper layer of the film will obviously be that facing the matrix through which it is exposed.” The problem of copying lies not so much in the avoidance of interference between the matrix and the negative (or original) and the print, or in the difficulty of getting correspondingly coloured units of the matrix to come under one another, as in the choice of the primary colours themselves. Here again an enormous amount of work has been done which it would be useless to discuss tonight, but it should be stated that the generally accepted idea has been that the primary colours used originally and in the copying material should not be identical. We have ourselves protected the idea of using primaries with large overlaps in order to obtain a matrix of minimum light-absorbing power—to obtain the shortest exposure for motion picture work. In order to compensate for these large overlaps we have tried primaries for the printing material which are so narrow that they barely, if at all, meet in the spectrum. You will see from a reference to Brasseur, which I will make immediately, that he had gone to another extreme and used three primaries for printing which were practically monochromatic light in the blue, green and red regions. 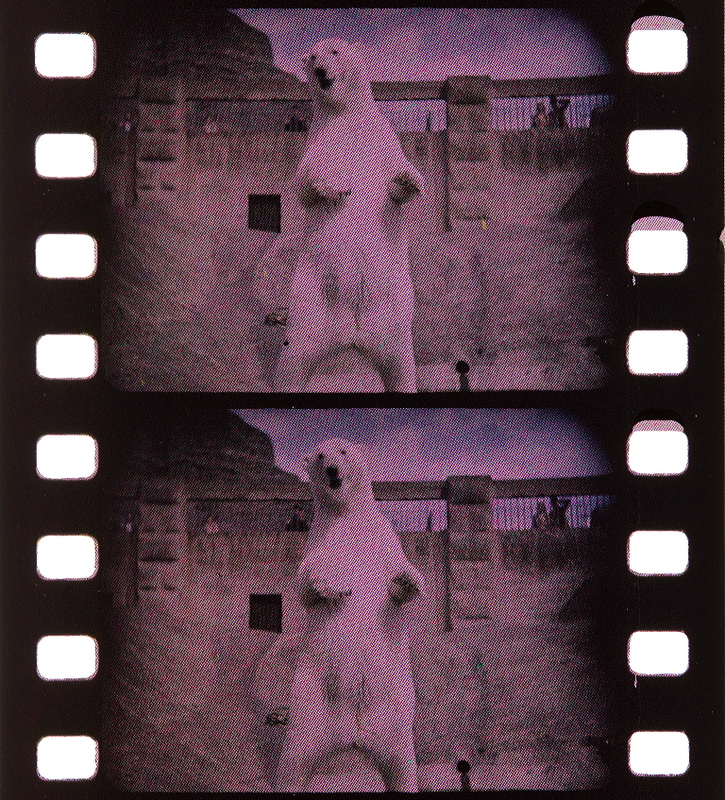 As a matter of fact, we find that we get perfectly satisfactory prints by printing from our negative stock reversed on to negative stock, again reversing. The tremendous overlaps in the spectrum which we have already seen are present both in taking and copying, and in spite of that the colours are rendered with perfect fidelity, and appear with equal fidelity in the duplicates. A reference to Brasseur’s patent specification (Fig. 11) of 1907 (12) might help to make things more clear. 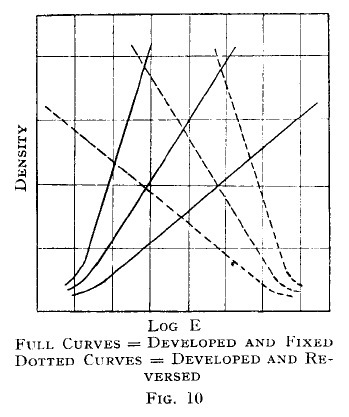 He used illustrations to show (1) Abney’s colour mixture curves; (2) Abney’s colour sensation curves; (3) the curves of du Hauron, drawn from Cherveul’s tables; (4) modified curves as used in the Brasseur process; (5) Maxwell’s colour mixture curves (largely indicative, by the way, of the Spicer-Dufay transmissions); and (6) the light transmitted through the Brasseur copying screens, narrow and quasi-monochromatic colours, which were blended to act as a special composite light for making copying possible without interference or falsification. 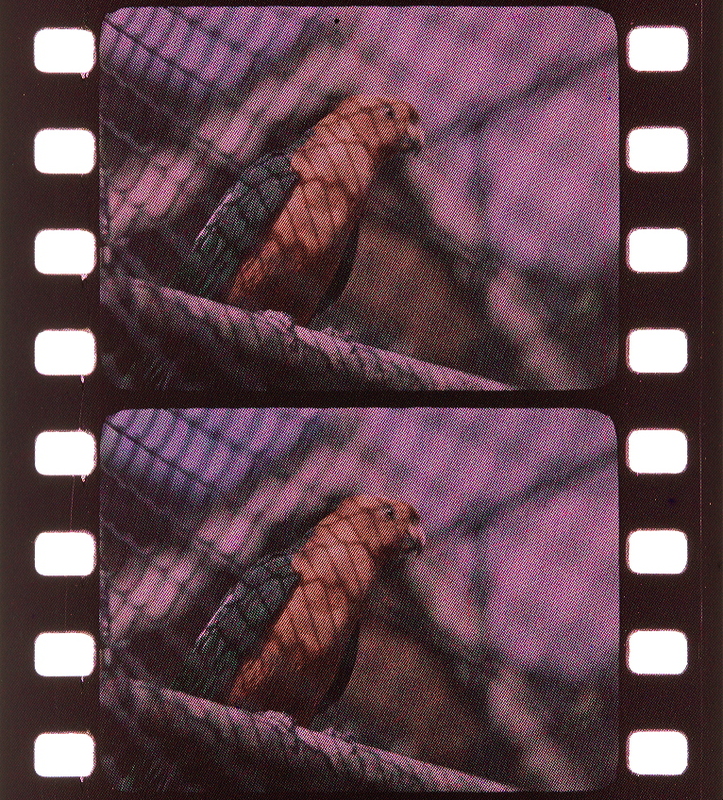 Brasseur’s first claim was to effect printing or copying by means of coloured glass screens through which, unlike the screens now used for colour photography, bands of pure light are transmitted which do not overlap one another, that is, which are separated by broad bands of absorption. 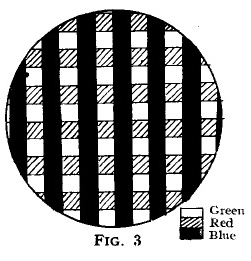 In his own words, also, “in the new process, one does not analyse the colours of Nature, but makes an analysis of an analysis.” These bands are shown by the shaded portions in Fig. 11, 6. 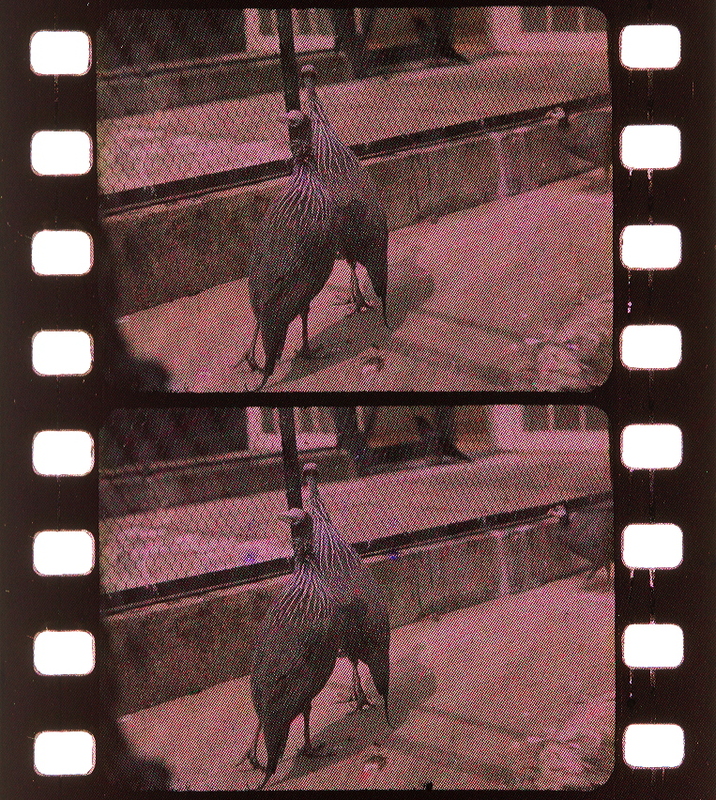 In making an ordinary kinematograph film a very great number of different shots are taken in the studio, and after the necessary editing, the negatives are joined up and sent to the printer. It, therefore, happens that the various shots are widely varying in density and character, and that during the continuous process of printing the strength of the light in the printing must be frequently varied. In the standard printer this is done by means of a resistance in the lamp circuit, and this resistance, as you know, is controlled automatically by means of a perforated band, which is prepared in advance by an expert, as a result of inspection or photometry. In copying colour pictures such a method is naturally denied us, because the inclusion of any resistance in the lamp circuit would alter the spectral distribution of the light. We have, therefore, made use of a lightly balanced circular drum (slide) into which are introduced a number of neutral grey filters, of density varying from 95 per cent, transmission to 33-1/3rd per cent, transmission. Whenever a variation in the strength of the light becomes necessary, the drum is automatically rotated through the necessary angle so as to bring the filter required into position between the lamp and the condenser. In this way continuous automatic printing is readily accomplished. The chief features of the printing machine are (i) the lens working at a very big aperture (f/2), which has, therefore, an extremely short depth of focus, so that when the silver image is crisply focussed, the matrix (owing to its separation) is slightly out of focus; and (ii) the piece of special diffusing glass, which, while not appreciably affecting the sharpness of the image, contrives still further to diffuse the image of the matrix. 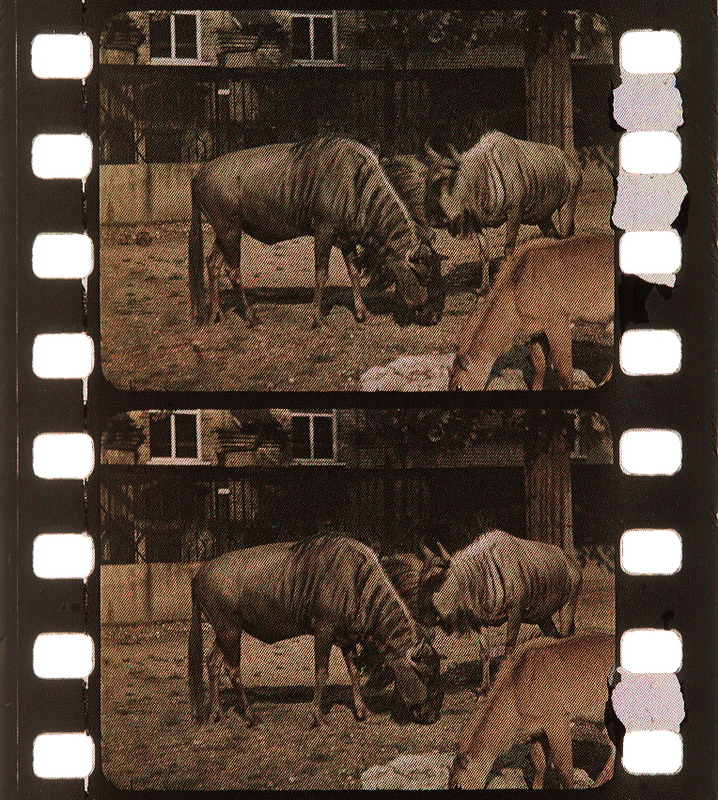 In the pictures which I shall now show, copies and duplicates have been indiscriminately mixed, and I can only say that we find it sometimes difficult on seeing pictures run on the screen in our laboratory to say whether they are originals or otherwise. Before running the pictures, I should like to take the opportunity of acknowledging the valuable co-operation of Mr. Charles Bonamico and the helpful suggestions and criticisms of Mr. S. R. Wycherley, throughout a long and often trying period of experimental work, and of Messrs. Spicers, Limited, with whose permission this paper has been read. (2) Welborne Piper, Brit. J. Phot., 1909, 56; Col. Phot. Supp., 3, 84. (3) Eder’s Jahrbuch, 1895, 9, 269. (5) Trans. Far. Soc.,No. 56, Vol. XIX, part 2, November, 1923. 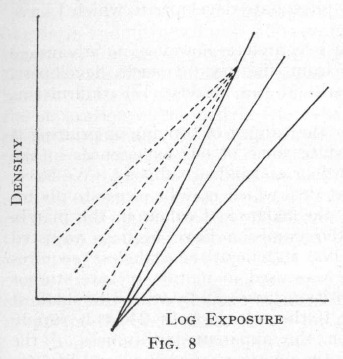 (6) “Investigations on the theory of the photographic process,” p. 307. (7) Veröffentlichungen Wiss. Zent. 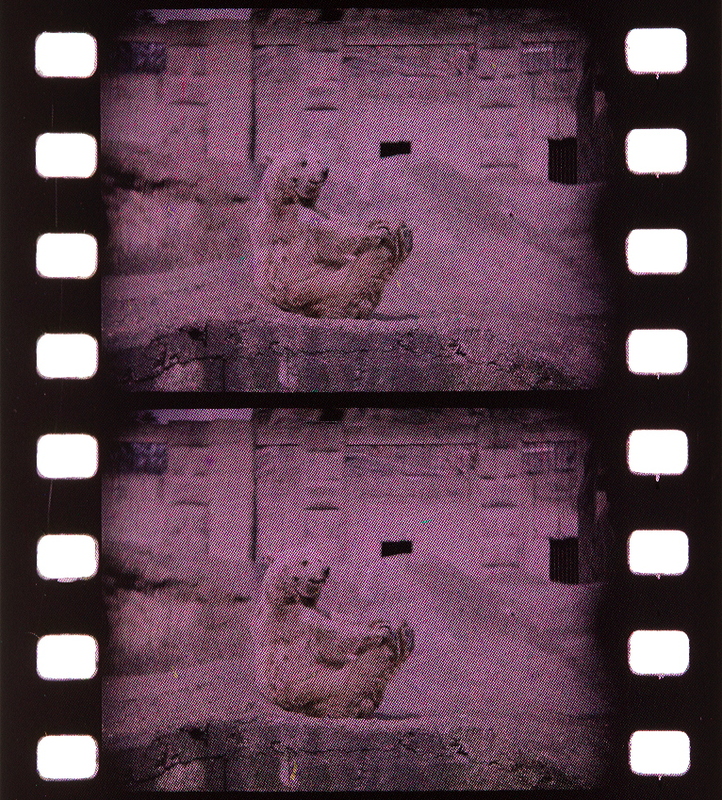 Lab., Agfa, 11, 62 (1931). (8) J. Franklin Inst., 1915, 141, 179. (9) Brit. J. Phot., 1910, 57, 24. (10) Phot. J., 1905, 45, 24. (11) J. Soc. Arts, 1908, 56, 195; Brit. J. Phot., 1908, 55, 41; Col. Phot. Supp., 2, 12; Phot. J., 1910, 50, 197; Brit. J. Phot., 1911, 5 8; Col. Phot. Supp.. 5, 45, 52, 62, 68. 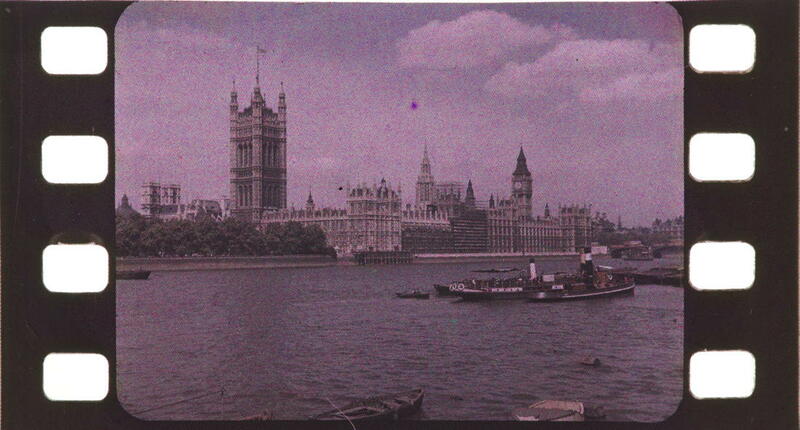 (13) Phot J., 1910, 50, 197. (14) Rahts and Schultz, loc. cit. (15) Journ. Soc. Mot. Pict, Eng., 1929, 13, No. 38, 406. 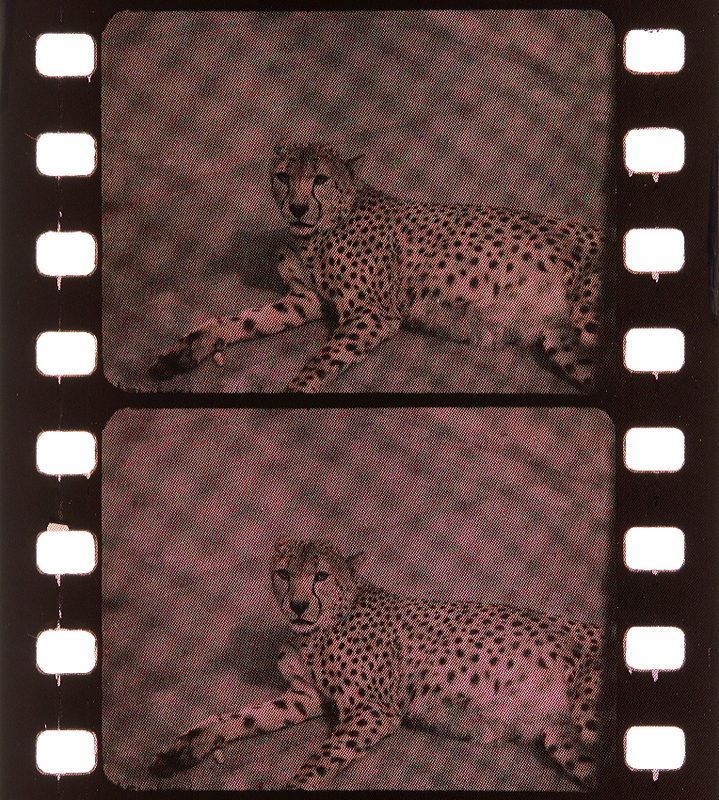 (16) Kinematograph Weekly. 1930, Jan. 16th, p. 71. (17) Phot. J., 1931, 71, 322. (18) Proc. VIIth Int. Cong. 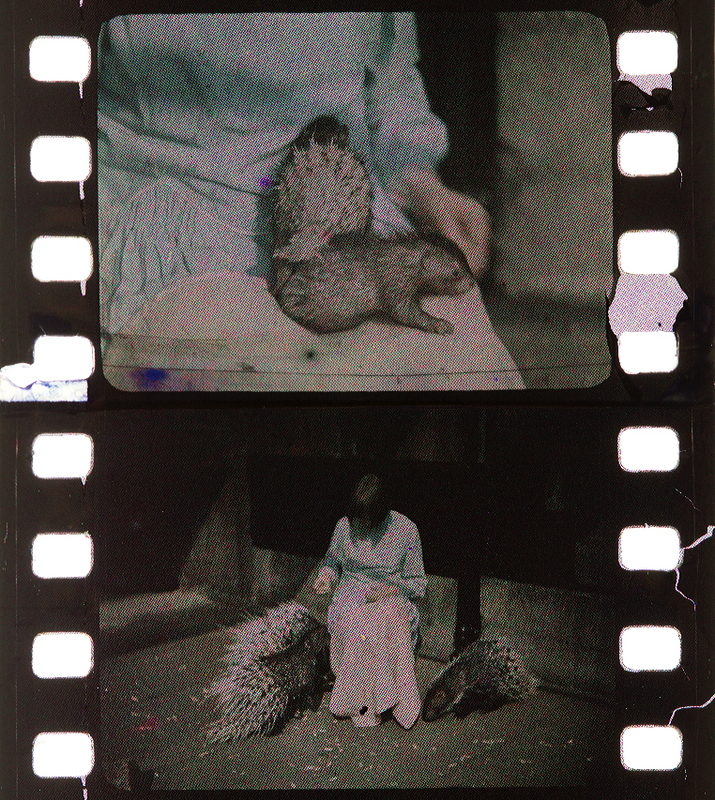 Phot., 1928, 152. (19) Brit. J. Phot., 1907, 54; Col. Phot. Supp., 1, 49, 75; Phot. Coul., 1907, 2,149. (20) Rahts and Schultz, loc. cit. 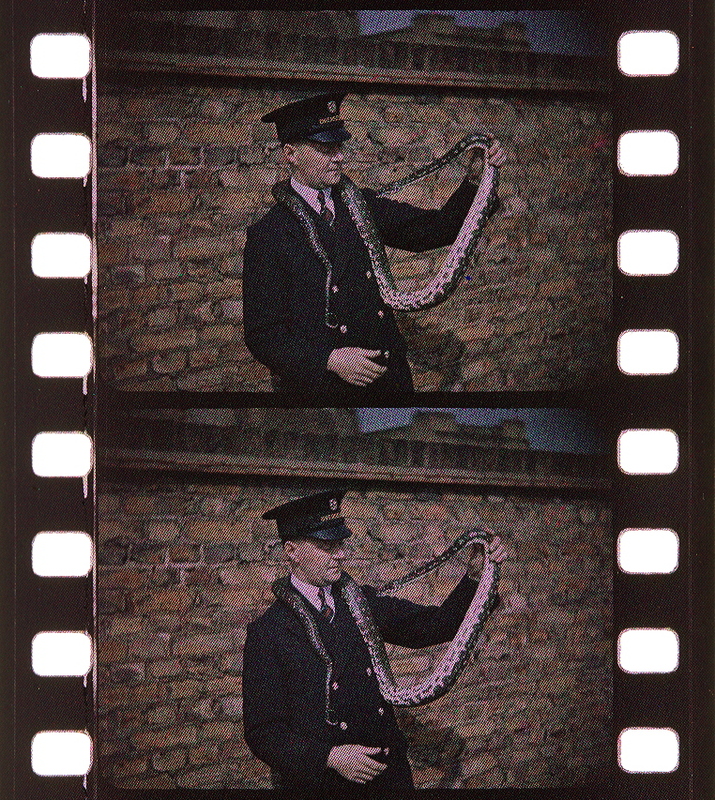 Mr. THORNE BAKER then showed a number of moving pictures in colour. These included both exterior and interior scenes, the latter comprising subjects in which highly coloured dress and toilet materials were displayed, also flowers and vases and domestic decoration. 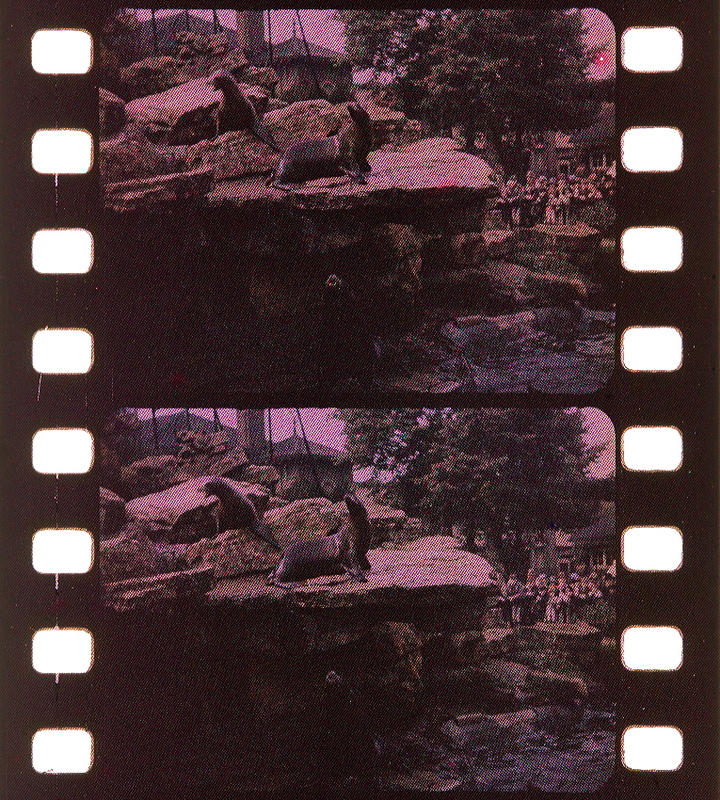 The exterior scenes included some very remarkable colour films taken in the Zoological Gardens, showing the movement and the colour of the animals in excellent fashion. The PRESIDENT said that it was evident from the applause of the audience that they had very much appreciated the films which Mr. Thorne Baker had projected, and he need hardly remark on the beauty of the colour rendering. Asked by a member what angle or field of view was available with this process, Mr. THORNE BAKER said that he thought the subjects which had been shown on the screen were rather indicative of that, but he would not like to give the field of view in actual degrees. There had not yet been enough experience of the process to give any considered answer on this point. Most of the work hitherto done had been of a laboratory nature, and although the tests were done on scientific lines, it really remained for kine studio photographers to find out these things in actual practice. In reply to a further question as to the temperature of the developer, Mr. THORNE BAKER said that the temperature was 65°. 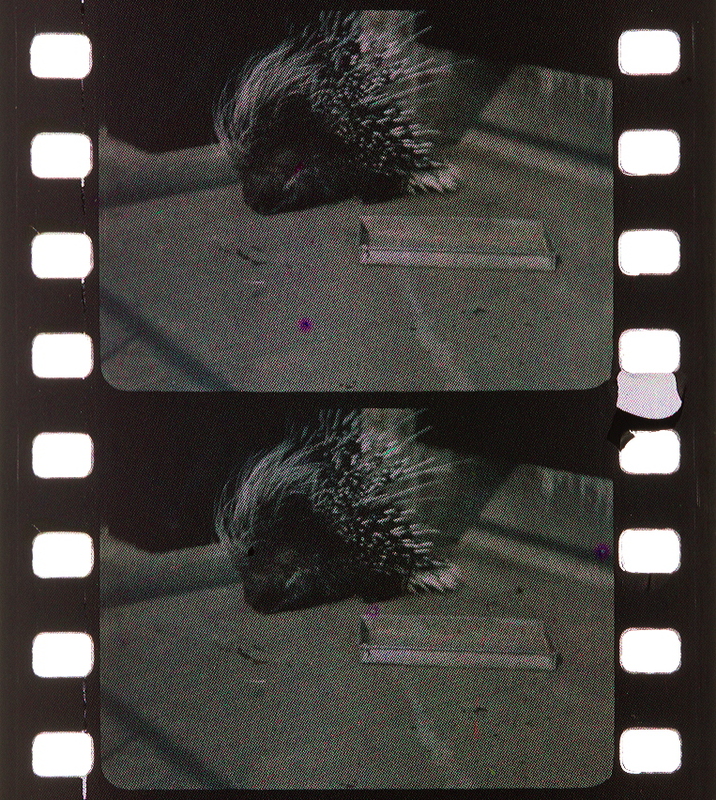 The actual formula was very similar to the Agfa formula, except that he used it at double strength, developing for eight and a half minutes at 65°. That, of course, applied to their own emulsion, and it required longer than any emulsion on screen plates because of the coarser grain. 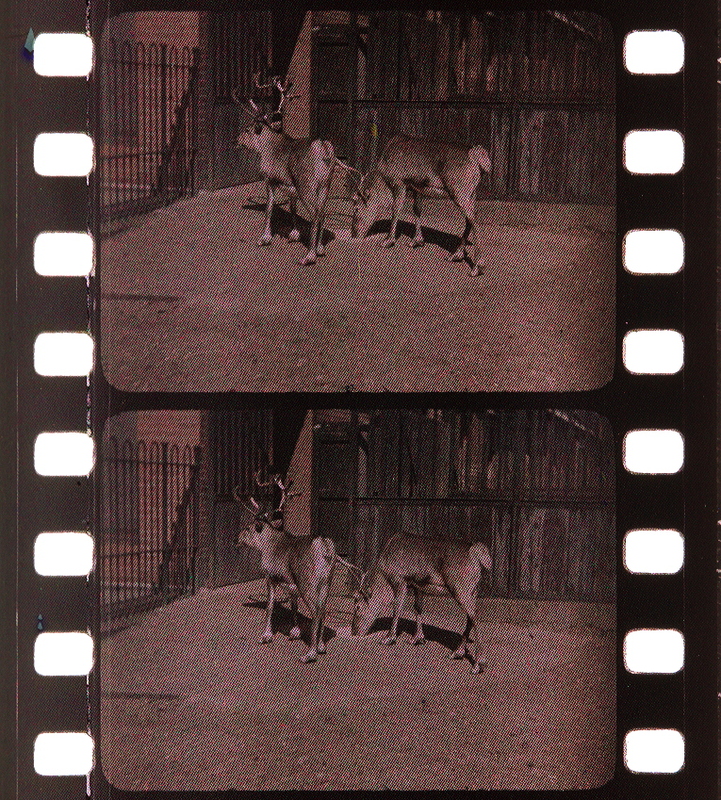 Mr. F. R. NEWENS enquired how the film compared in speed with the new Agfa plate, to which Mr. THORNE BAKER replied that with this film the exposure in noon-day June sunlight at f/8 was about one-fifth of a second. That was the best idea he could give. A MEMBER asked if Mr. Thorne Baker thought that the projection of the pictures that evening would have been brighter had a more powerful lamp been used. Mr. THORNE BAKER replied that he did not think these pictures if illuminated very brilliantly gained any advantage. The eye adapted itself to what it saw on the screen. 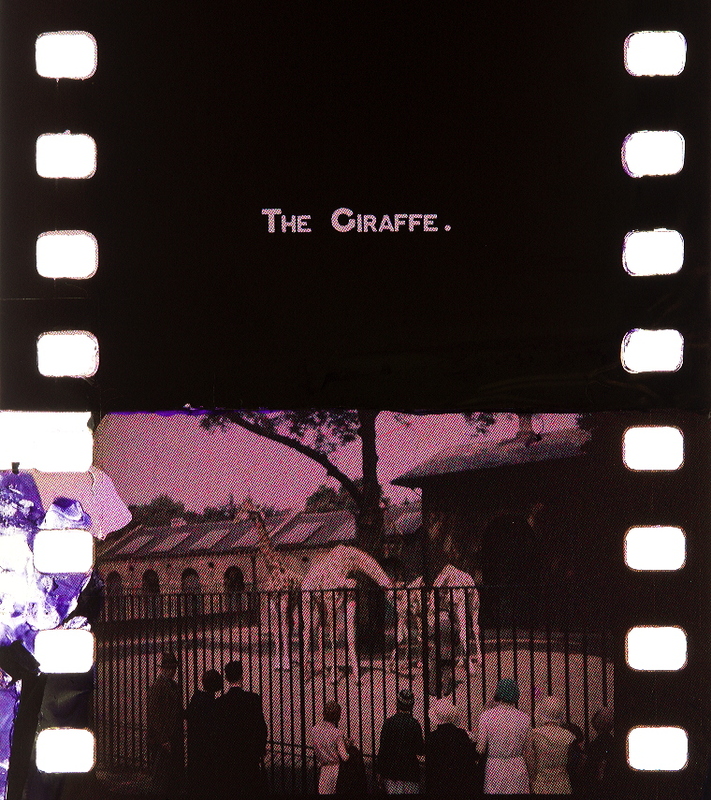 These films had already been shown in a number of the large theatres in London, and in all cases the same amount of light was employed as in ordinary black and white kinematograph projection. The general opinion had been that for colour work a too high illumination detracted from the beauty of the results. It was better to let the eye adapt itself. The MEMBER who had asked the question said that it appeared to him that in many cases the shadows did not seem to get a chance, and he thought that the illumination was not quite sufficient to give the suggestion of colour in the extreme shadows. These shadows were virtually black, though one would expect some suggestion of luminosity. Mr. THORNE BAKER replied that he did not think a stronger illumination would make a black shadow any other colour. 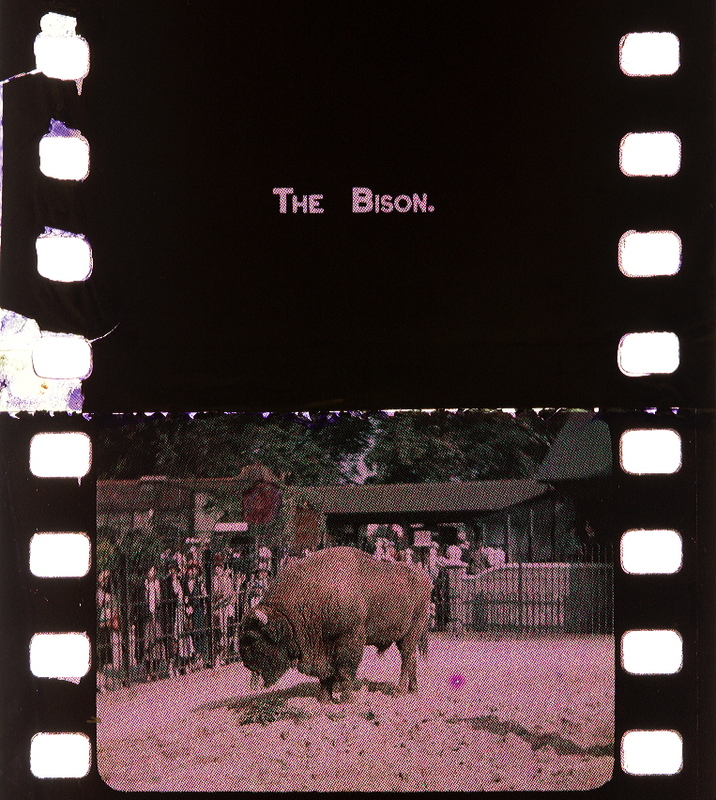 The studio pictures shown that evening were taken in a small laboratory studio at Sawston, in Cambridgeshire, and this did not at all represent what could be done at Elstree. He added that it was very kind of his audience to have listened with great patience to a technical exposition. He had made his paper a little more technical than he might have done on an ordinary evening, because he wanted to put on record some account of the work which had been done, and a bibliography would be added to the paper when it appeared in the Journal. His directors would, he was sure, allow him later on to show to the Society a more “exciting” piece of film when this film was got into the studios. Mr. F. R. NEWENS, on behalf of the Colour Group, desired also to compliment Mr. Thorne Baker on the show he had provided. The members of the Colour Group would appreciate the amount of information contained in his paper. When printed in the Journal it would be something for them to fall back upon, and he felt sure it would result in the colour work of the members of the Society being very much better than heretofore. He suggested that on the occasion of the next annual exhibition a point should be made of getting Mr. Thorne Baker on the Board of Judges. They would appreciate his very clear and encouraging references to colour work. 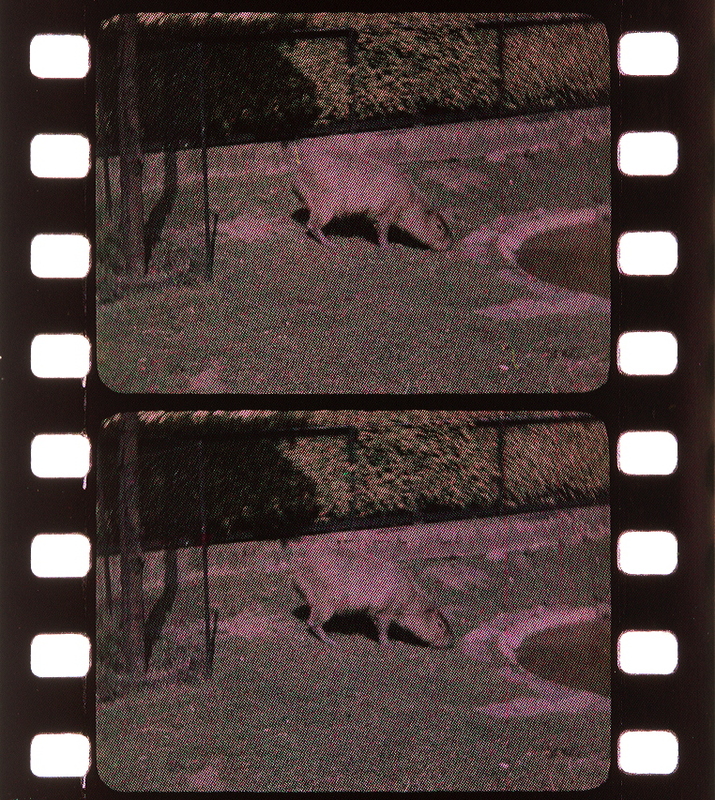 He desired to ask whether there was any likelihood of the Spicer-Dufay film being available for the amateur “still” photographer, as in the case of the Agfa and other products. Everyone who had seen the pictures that evening would agree about the excellent colour rendering given. It was quite equal, he thought, to the average of screen plate production, despite the fact that, as Mr. Thorne Baker had said, the photogiaphy had been more or less of an amateur character, and, moreover, the work had been handicapped by the kind of summer which had been experienced this year. Mr. THORNE BAKER said that it might perhaps be advisable for him to add a few words about the position with regard to securing supplies of this film. 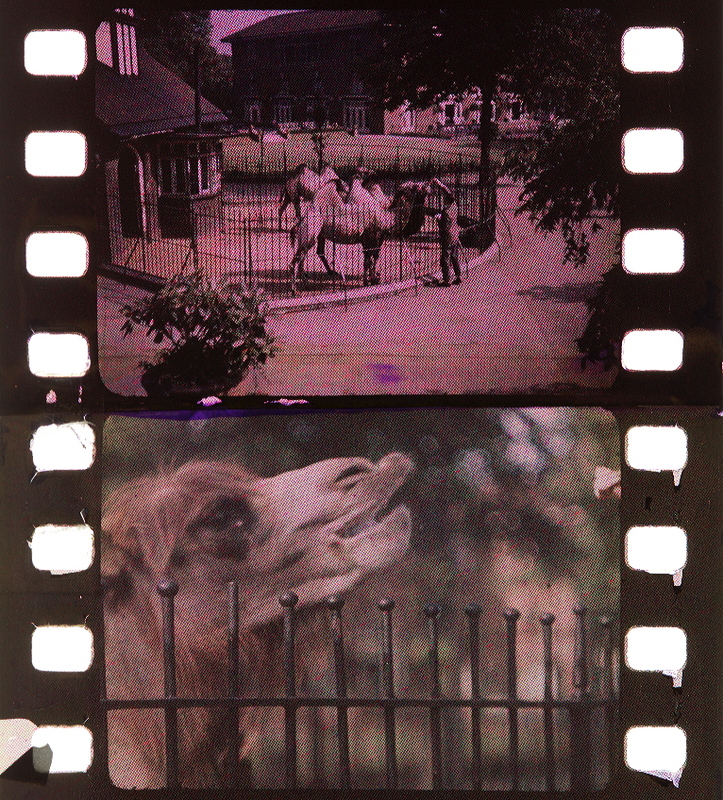 He hoped that within a few months it would be possible to purchase it in the form of roll films and flat films. That, of course, was subject to the arrangements for manufacture. 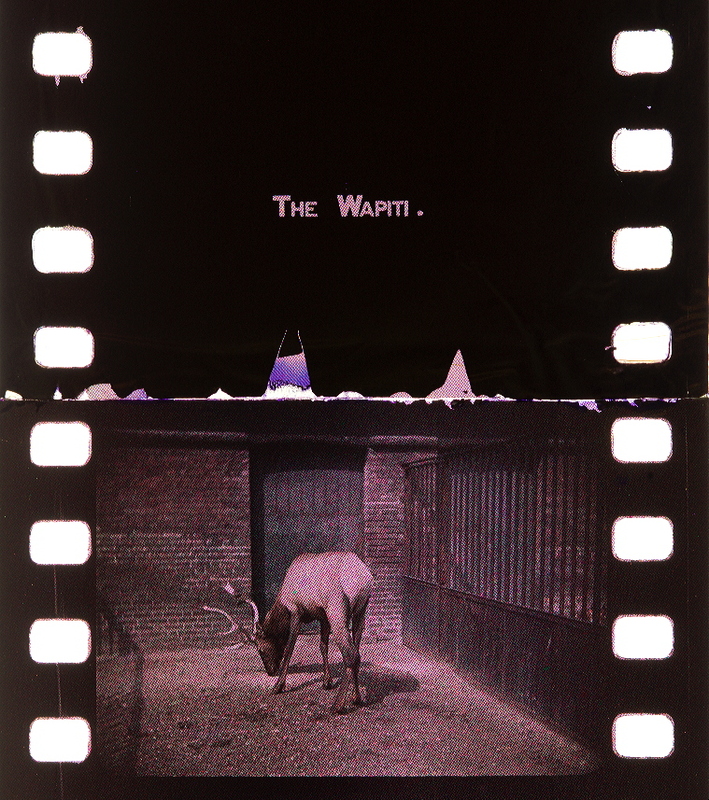 Many people had written to Spicers and begged for small pieces of film, and some had received it, and some had not. What those concerned in this process felt was that this was a very valuable piece of work in the photographic world, and they did not want the product to get into the hands of amateurs or professionals or the motion picture industry until it was forthcoming on a large manufacturing scale, and could be properly standardised in a similar way to the materials which photographers were using to-day. It would be made available as soon as possible. The PRESIDENT said he was sure the meeting would desire to convey to Mr. Thorne Baker its hearty thanks for his clear exposition of the Spicer-Dufay process, and for the projection of the films. 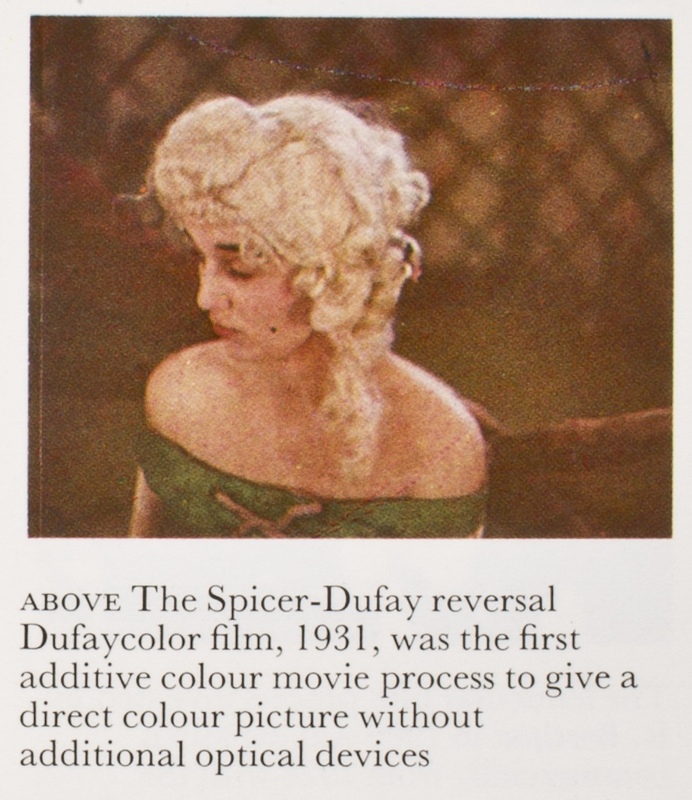 (Thorne Baker, T. (1932): The Spicer-Dufay color film process. 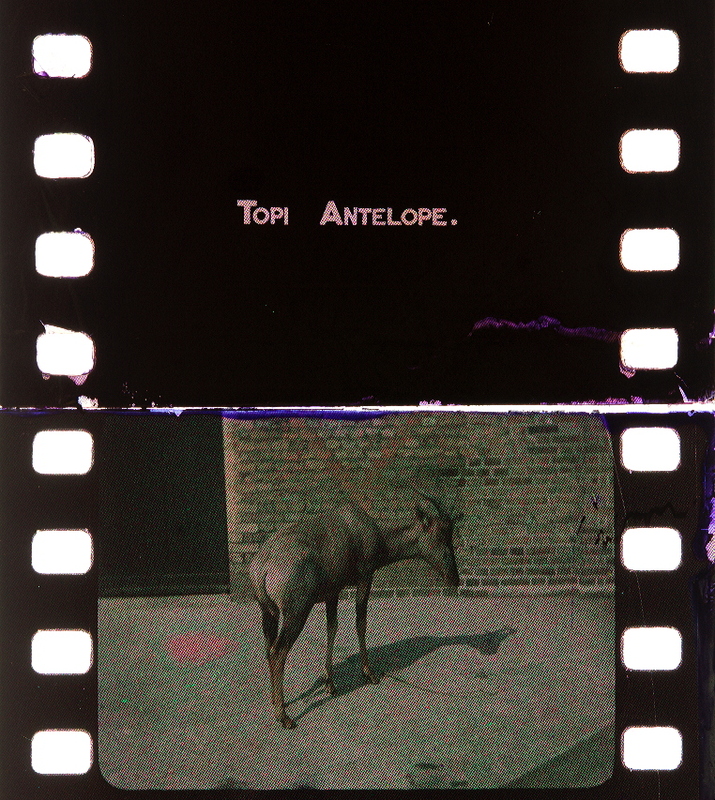 Photographic Journal, 72, 109 (1932), pp. 109-117. 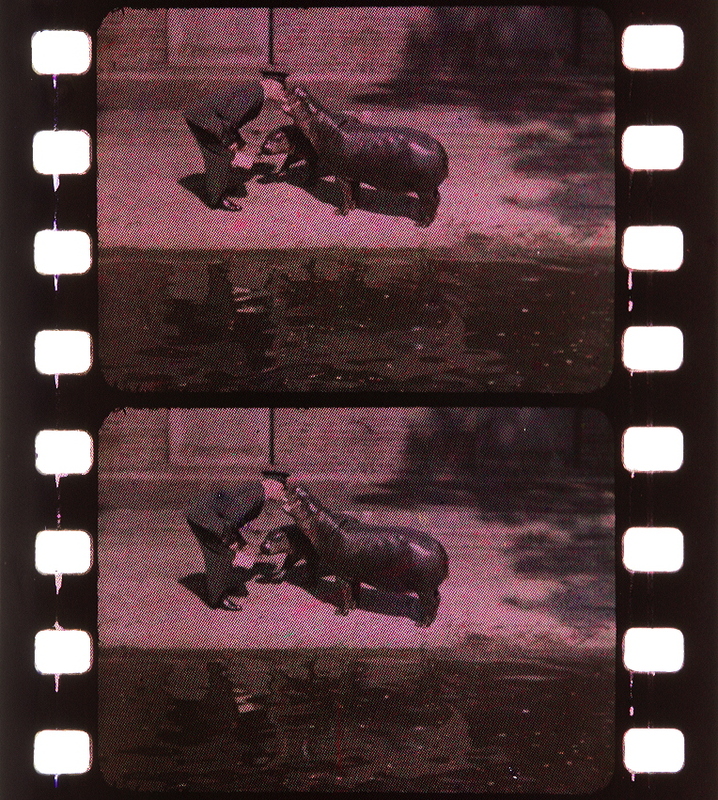 “1925-35.— Originating in the Dufay “Dioptochrome” plate the Dufaycolor mosaic film has so far been the only successful attempt to apply the micro colour-screen method to motion-picture film. 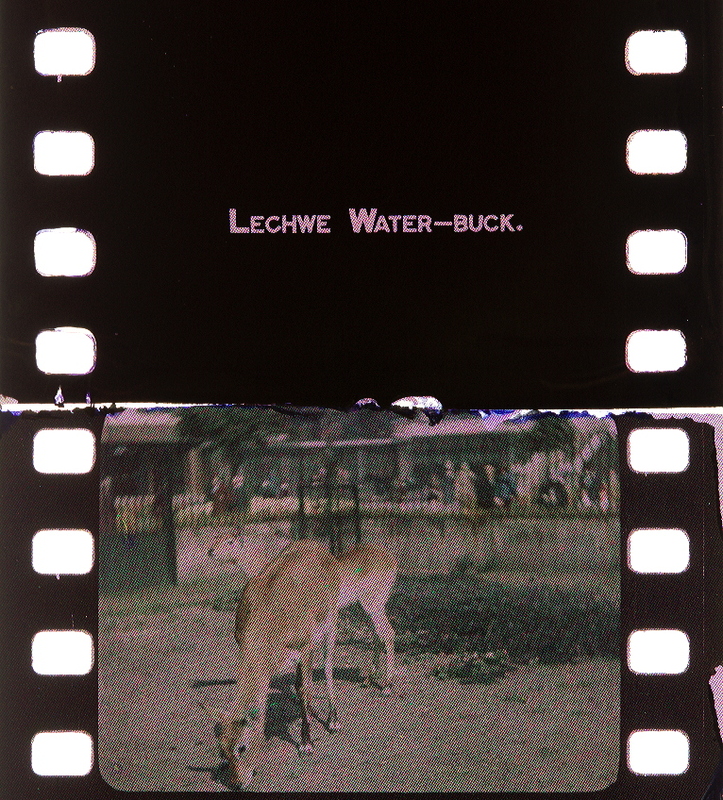 The “Dioptochrome” plate was made under the patents of Louis Dufay, a French photographer, and his screen plates were on the market from 1910 to 1917. From 1925 onwards a very large number of patents were granted for various aspects of what was then known as Spicer-Dufay process. A great deal of money was spent by Spicers Limited, the well-known paper manufacturers, on perfecting this process. The technical work in England was under the supervision of T. Thorne Baker, F.R.P.S., who with Louis Dufay and Charles Bonamico had carried out all the earlier research previous to the Spicer period. Baker has recounted that several thousand feet of negative were made in the south of France on 8-line (per mm.) 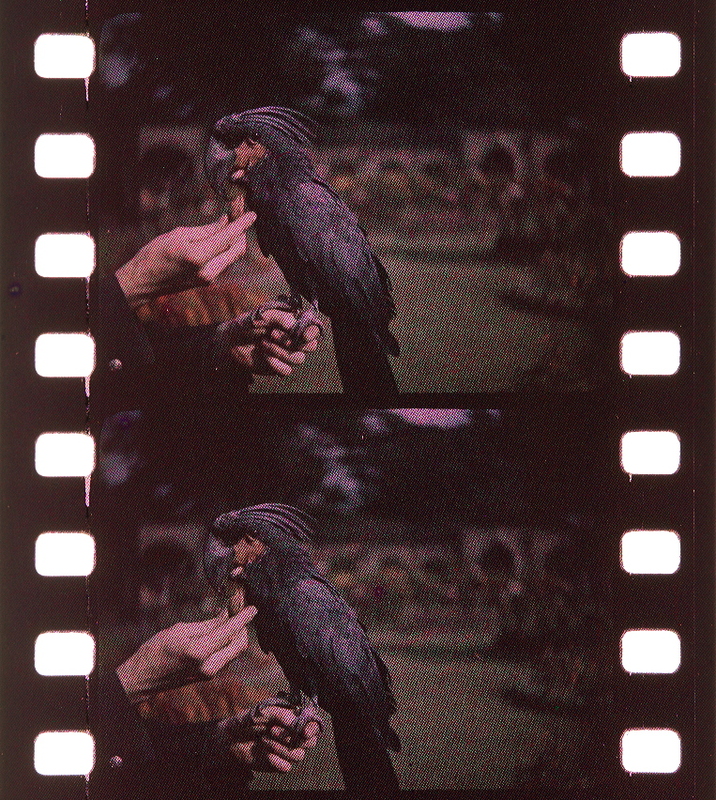 réseau, and prints from these were shown at the Pavilion Theatre, London, in 1928, but the colour dilution due to irradiation was excessive. 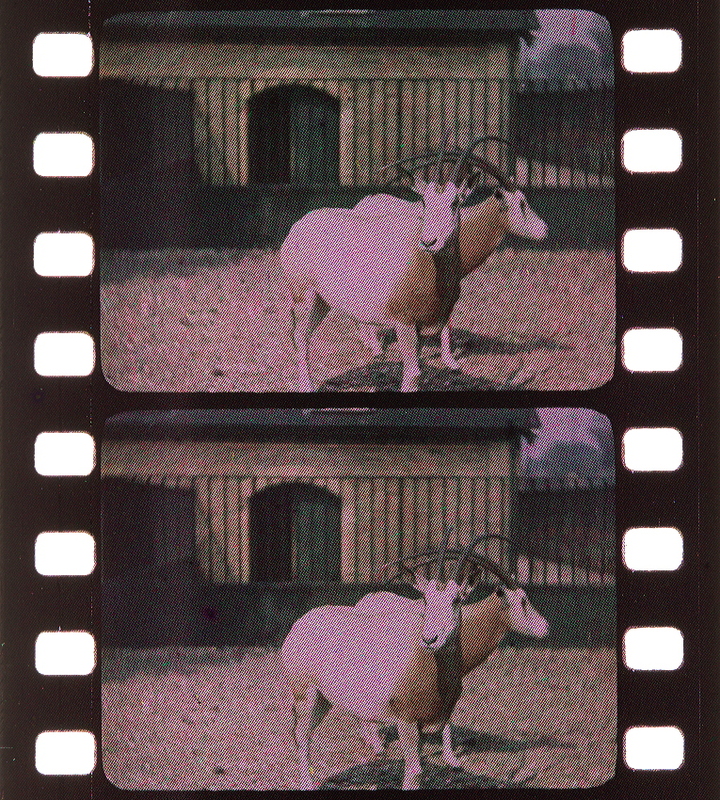 In 1931 the first satisfactory films were exhibited in England, but at this period the problem of copying the original film (a coloured reversed positive) had not been satisfactorily solved. 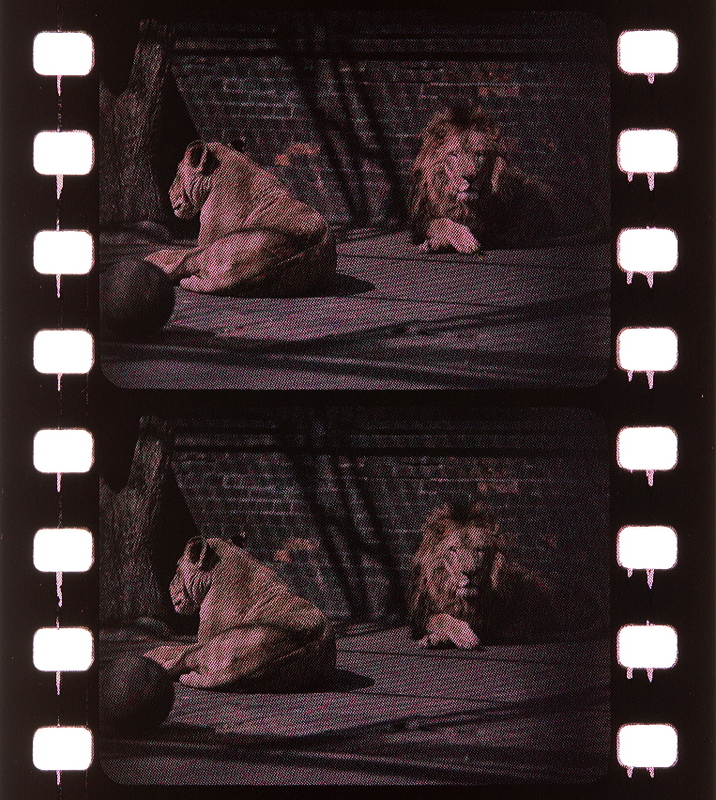 In 1934 Ilford Limited acquired the control of the British Empire rights and during this year they placed on the market 16 mm. film which received an enthusiastic welcome from amateur cinematographers. 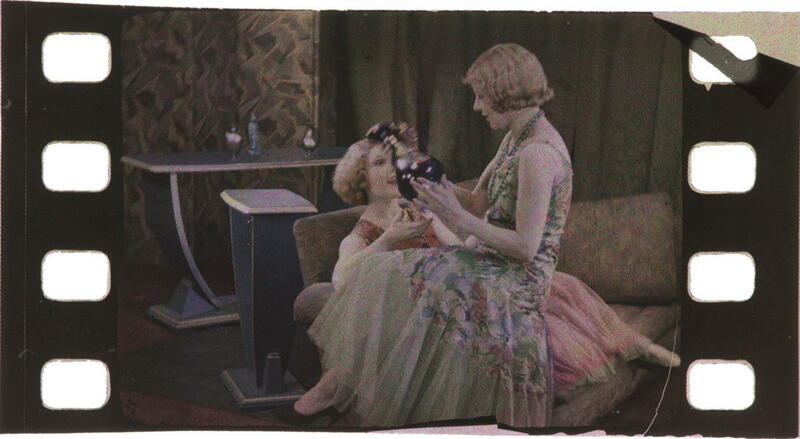 During 1935 a certain amount of work was produced in the studios, notably a sequence in a film called “Radio Parade,” a British International Pictures production. 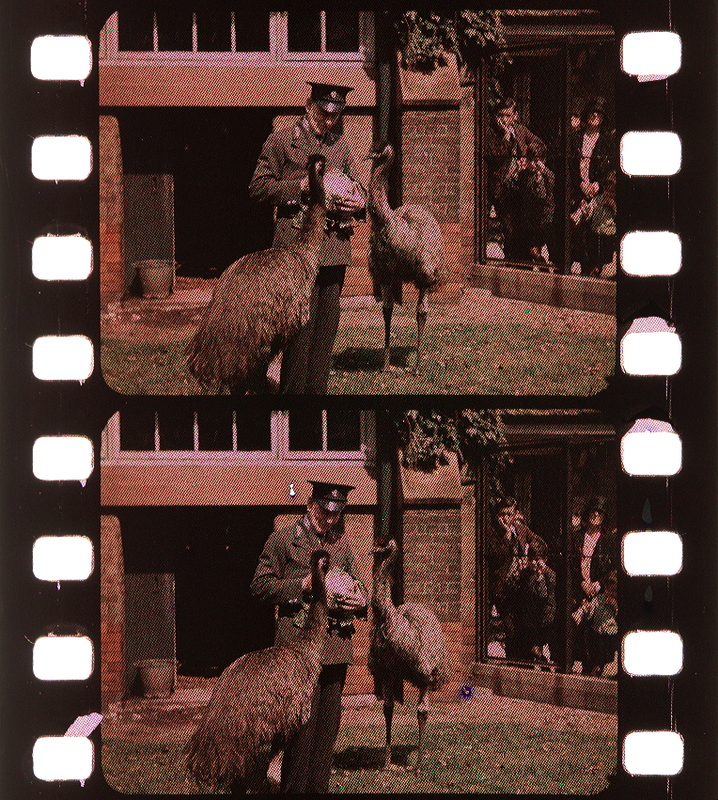 During this year British Movietone News exhibited some Dufaycolor news pictures of the Jubilee processions which necessitated printing a large number of copies very rapidly. 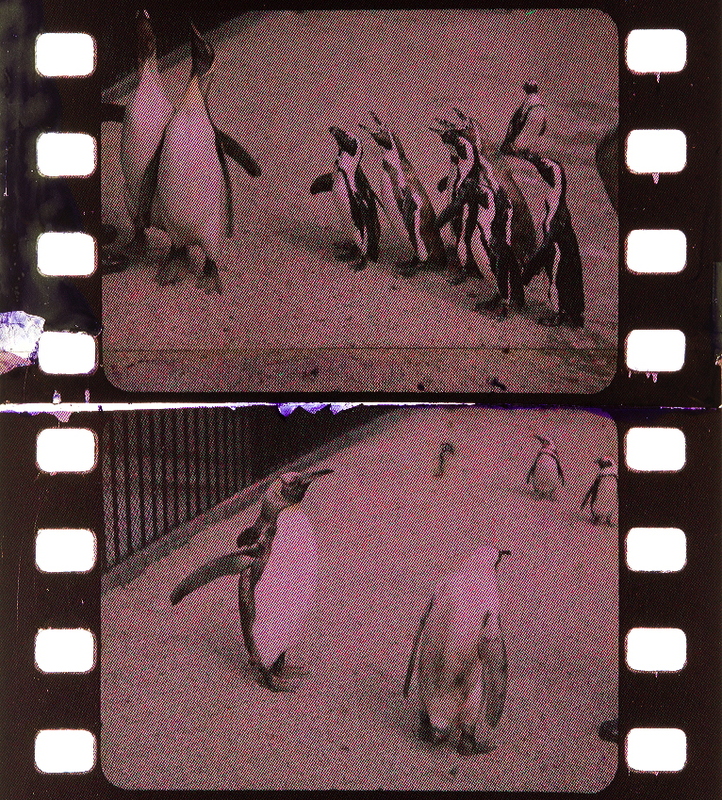 These prints were reversal copies and they suffered from a granular effect known as “boiling.” The work at this period was carried out by Kay’s Laboratories Ltd., of London. 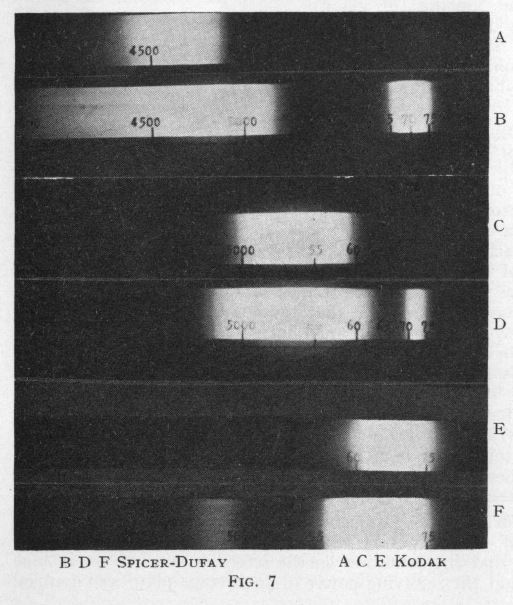 The invention by Dr. D. A. Spencer, F.R.P.S., in 1936, of the depth developer made negative-positive processing practicable, since the restriction of development to the layer of emulsion in immediate contact with the réseau reduced spreading of the image with its consequent desaturation; also irradiation is reduced to a minimum. Furthermore the work of Dr. G. B. Harrison of Ilford Ltd. led to great improvements in the illumination system of contact printing machines, moiré patterns being completely eliminated. 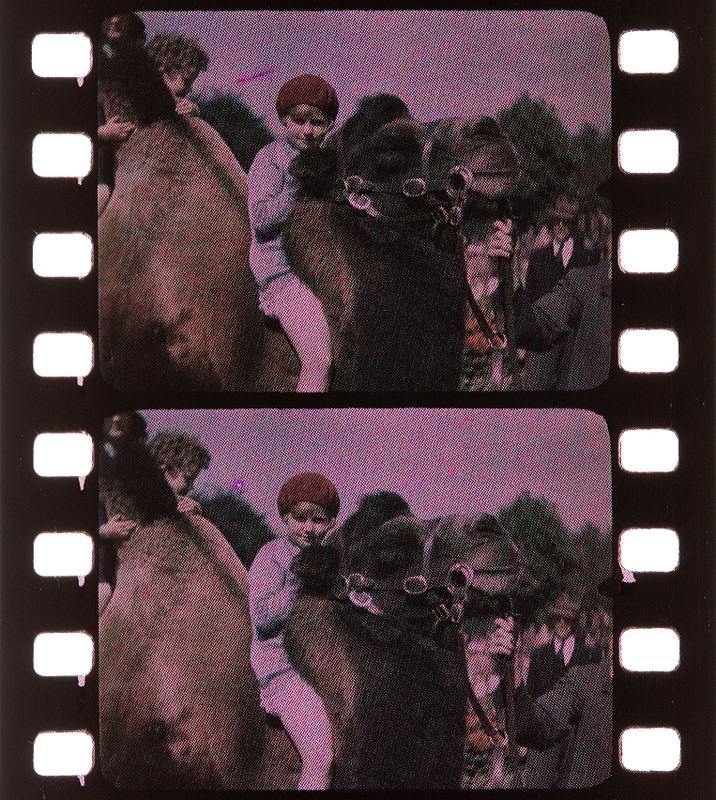 “Man hat dieser Tage in Wien einen neuen Farben-Tonfilm zur Vorführung gebracht. So gewinnt denn das Thema “Farbenfilm” nun besondere Aktualität. In mehreren Ländern wird eifrig an der Lösung der technischen Probleme der Farbenkinematographie gearbeitet und es schient, dass wichtige Ergebnisse in absehbarer Zeit zu erwarten sind. Zu den interessantesten, in der letzten Zeit vorgeschlagenen Lösungen gehören das unter Nr. 360.819 in den Vereinigten Staaten angemeldete Verfahren der “Mulicolor Film Inc.”- und das “Spicer-Dufay”-Verfahren, über das Herr Thorne Baker kürzlich auf einer Sitzung der Kgl. Gesellschaft für das Lichtbildwesen in London referierte. Das “Spicer-Dufay”-Verfahren ist zu den Systemen zu rechnen, bei denen von einem mikroskopischen Linsenraster Gebrauch gemacht wird. Das unentflammbare Trägerband wird von der Spicer Ltd. eigens in ihren Fabriken zu Swatson hergestellt. Das Netz besteht aus Linien, die im Abstande von 1/20 mm voneinander mit fetter Farbe gezogen sind. Diese Linien müssen äusserst schmal und scharf aufgetragen werden, was beträchtliche Schwierigkeiten bei der praktischen Ausführung mit sich bringt. 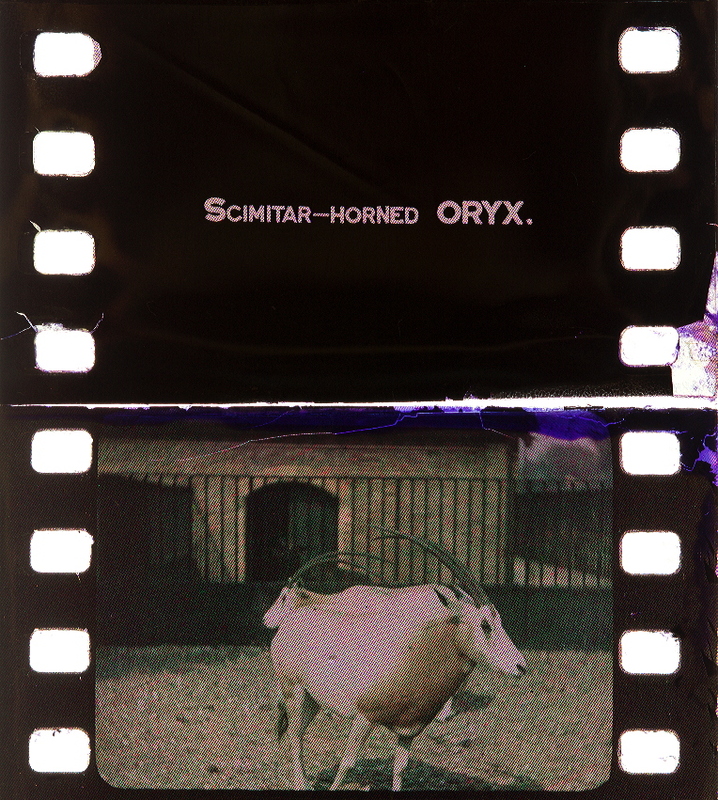 Nach dem Spicer-Dufay-Verfahren werden sie auf eine dünne, grün gefärbte Kollodiumschicht, die das Filmband bedeckt, aufgetragen. Der Film wird zuerst in ein Bleichbad getaucht, wobei die Kollodiumschicht die grüne Färbung verliert, ausser an den Stellen, die unter den mit fetter Farbe gezogenen Linien liegen. Dann wird der Film in eine rote Farblösung getaucht; man erhält so mikroskopische grüne und rote Linien, die miteinander abwechseln. Endlich wird auf ähnliche Art ein Netz von blauen Linien senkrecht zu den beiden anderen Liniensystemen erzeugt. 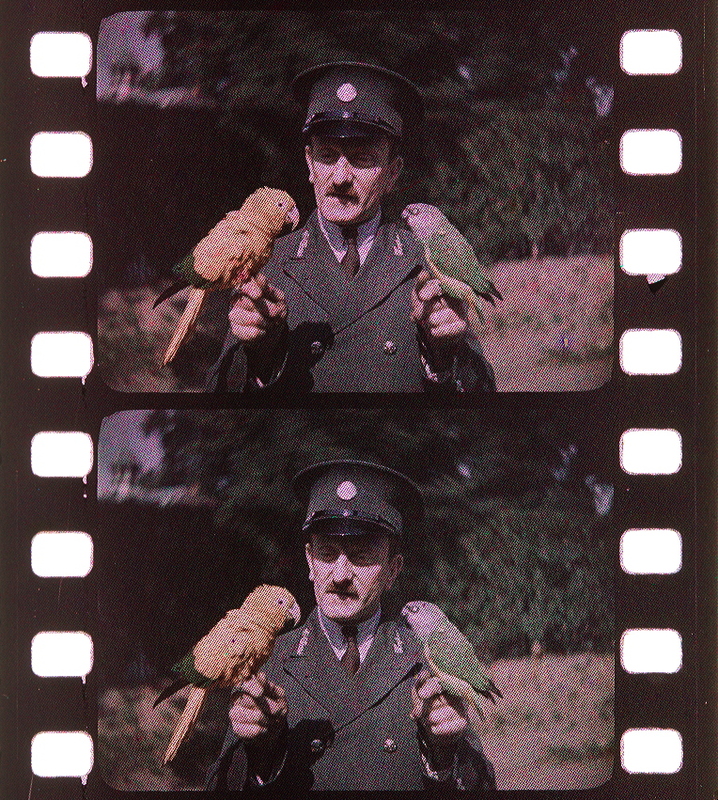 Nach dieser Behandlung ist also auf dem Film ein dreifaches System von Linien aufgetragen; die roten und grünen Linien liegen einander parallel und wechseln miteinander ab, während die blauen Linien senkrecht auf ihnen stehen. Eine der interessantesten Besonderheiten dieses Verfahrens ist die Art, wie die Positivkopien erhalten werden. Bekanntlich geschieht dies bei den Rasterverfahren meistens durch Umkehrung. Vom ersten durch Umkehrung gewonnenen Positiv werden zunächst die Doublenegative und dann die weiteren Positivabzüge erhalten. Beim Spicer-Dufay Verfahren werden hingegen direkt vom Originalnegativ einige wenige Doublen abgezogen, die dann zum Abziehen der weiteren Kopien dienen. Natürlich ist für das Abziehen eine besondere optische Vorrichtung erforderlich. Zwischen dem oberen Teil des Silberbildes und dem Netzte selbst befindet sich eine dünne, etwa 6 bis 8 Mikron breite Schicht. Man wird daher tadellose Kopien erhalten, vorausgesetzt, dass man sich eines Objektivs mit grossem Öffnungsverhältnis bedient. Das Abziehen erfolgt auf hochempfindlicher Filmschicht bei einer Frequenz von etwa 800 Bildern pro Minute. 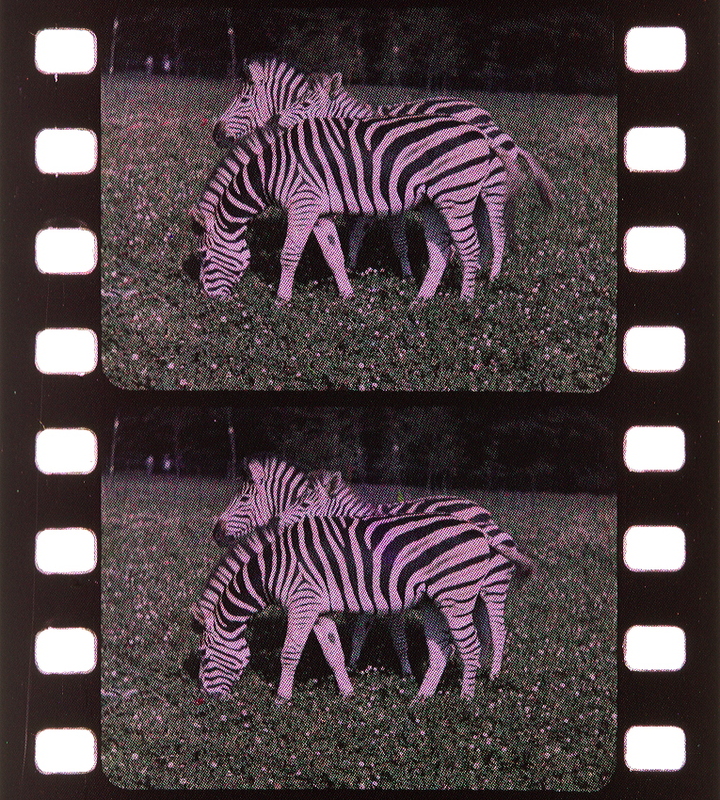 “Der Vorteil von Linien- und Linsen- gegenüber dem Kornraster lag in der exakten Struktur der Filmrasterung: beim Linienraster die Anordnung der Farbstoffpartikel zu parallel verlaufenden oder einander kreuzenden Linien, beim Linsenraster eine Textur dicht nebeneinander liegender, linsenförmiger Segmente, die im Gegensatz zu den anderen Rasterverfahren keine Farbstoffe enthielt. Aufgenommen wurde auf Linien- und Linsenraster durch ein dreiteiliges Streifenfilter in den Grundfarben der additiven Farbsynthese Grün, Rot und Blau, das bei der Projektion wieder vorgeschaltet werden musste. Als erfolgreiches Linienrasterverfahren hat sich Dufaycolor in die britische Foto- und Filmgeschichte eingeschrieben: Benannt nach dem französischen Fotografen Louis Dufay, dem Vater des in den 1910er Jahren ausgeübten fotografischen Linienrasterverfahrens Dioptichrome, wurde das Kinoverfahren ab 1925 in britisch-französischer Zusammenarbeit unter dem Namen Spicer-Dufay (Beteiligung der britischen Firma Spicers Limited) entwickelt und erste Kurzfilme 1928 in London präsentiert.52 Mit Gründung der Spicer-Dufay Ltd. 1933 verlagerte sich die Auswertung des Verfahrens nach England. 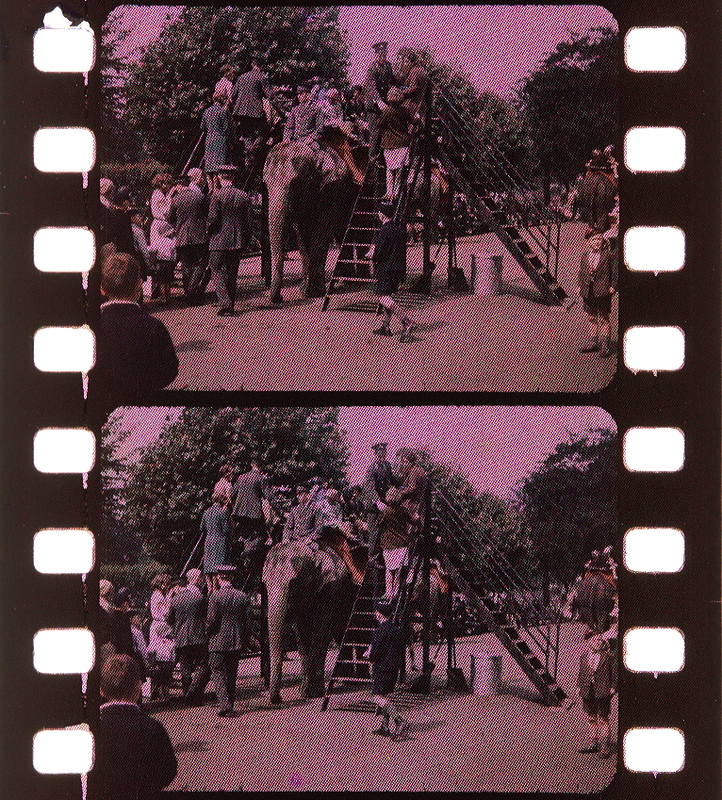 1934 entstanden Musiknummern des Films Radio Parade of 1935 (UK 1934, Arthur B. Woods) auf Dufaycolor-Umkehrfilm. Mit dem 1936 eingeführten Negativ-Positiv-Verfahren folgte neben Kulturfilmen und Wochenschausujets überwiegend patriotischer Tendenz auch der einzige abendfüllende Linienrasterspielfilm Sons of the Sea (UK 1939, Maurice Elvey). 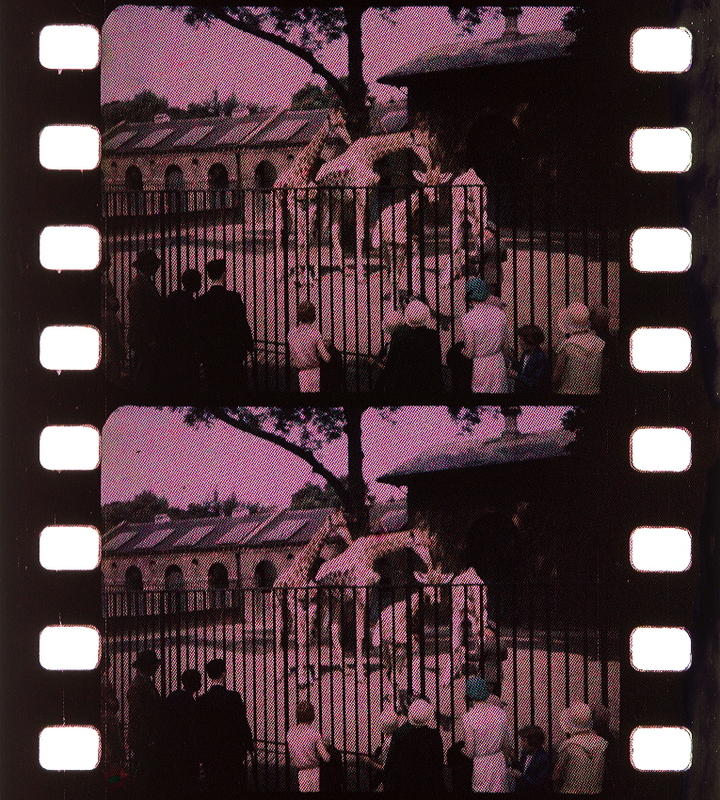 Zum Zeitpunkt der Uraufführung dieses Films aber hatte sich in Großbritannien bereits das US-amerikanische Technicolor-Verfahren etabliert, gegen das sich Dufaycolor nicht mehr durchsetzen konnte, obwohl es Ende der 30er u.a. auch in den USA, der Schweiz und Italien erfolgreich eingesetzt wurde. 52 Vgl. 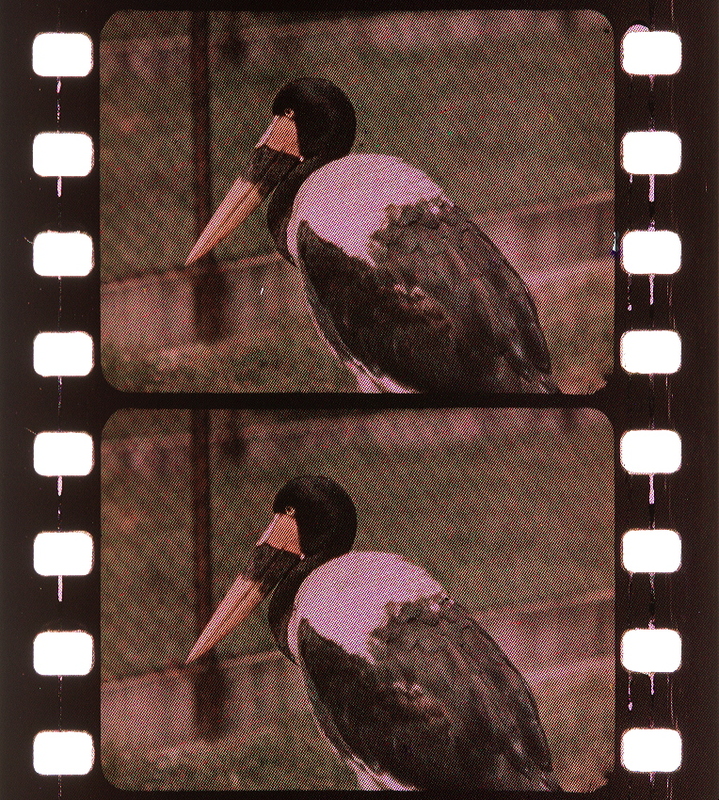 Koshofer: Color, S. 32. 53 Siemensarchiv, 35/65, Ls 888, Edgar Gretener: Kurzer Überblick über Physik und Technik des Berthon-Siemens-Farbfilm-Verfahrens. Vortrag auf der Physiker-Tagung in Bad Salzbrunn September 1936. Sonderdruck aus: Zeitschrift für technische Physik, Nr. 4/1937, S, 97.